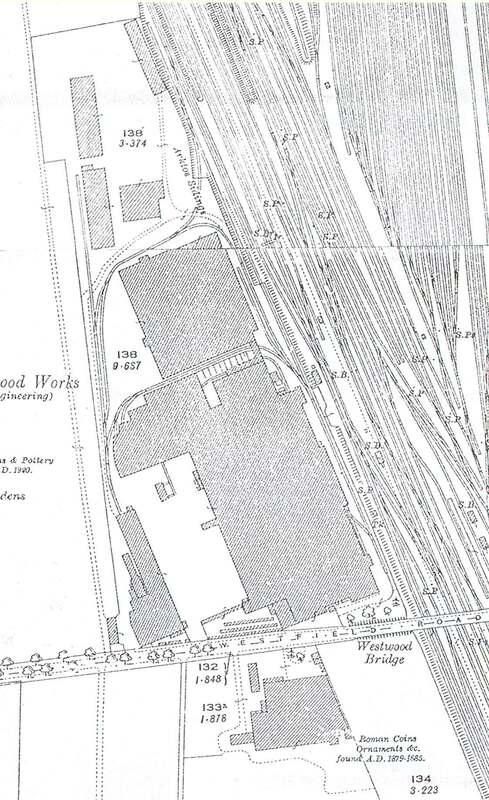 This section provides a record of the development of Westwood Works from 1904 to 1992. 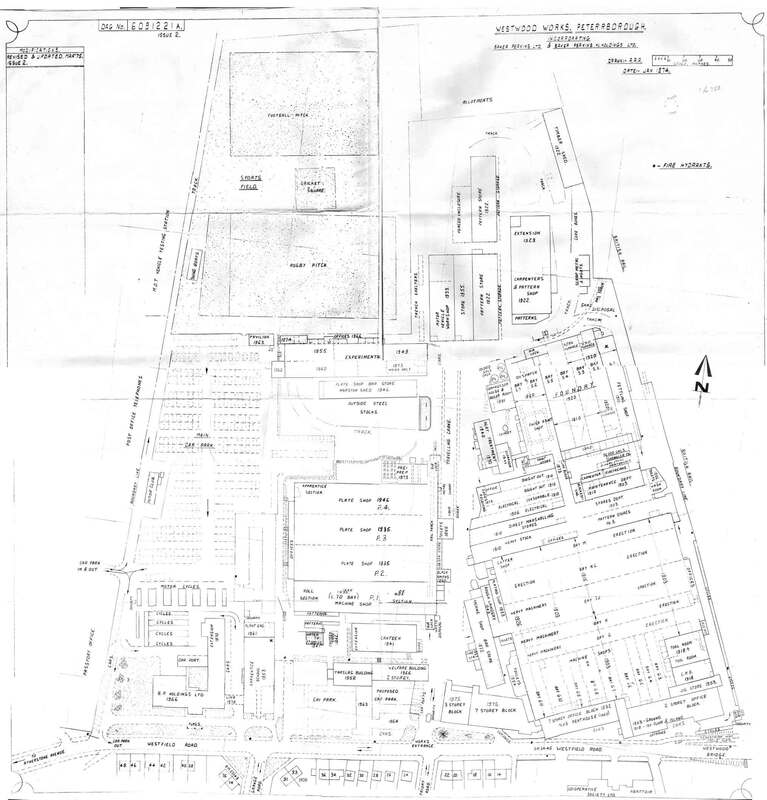 The Site Plans show how the factory grew and how the role of individual buildings changed over the years. 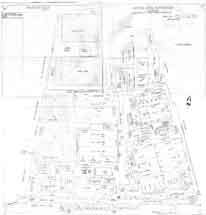 For completeness, we are seeking a Site Plan dated in the 1950s/1960s, i.e. 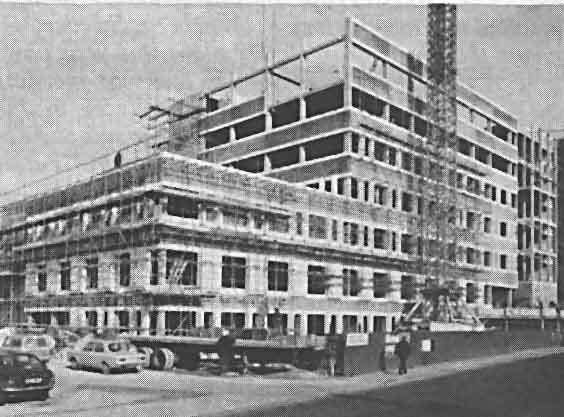 before the construction of the 1975 Office Building. 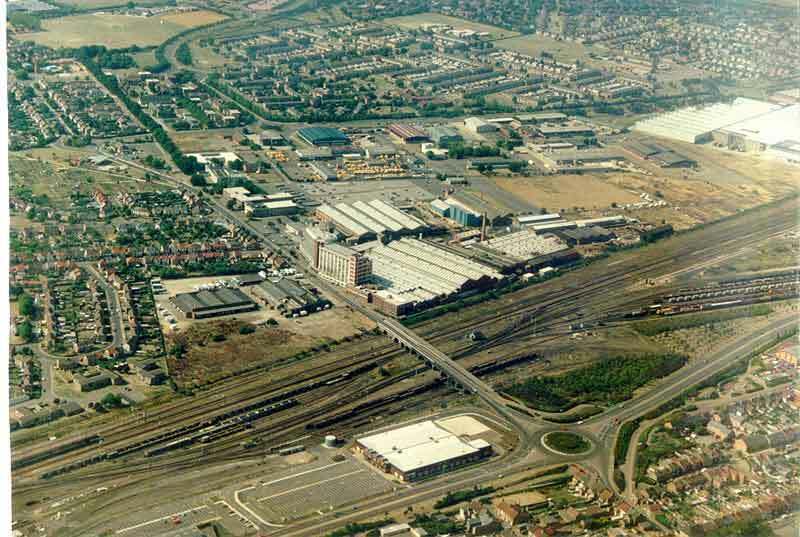 WHY PETERBOROUGH IS BOUND TO DEVELOP INTO A LARGE INDUSTRIAL CITY! 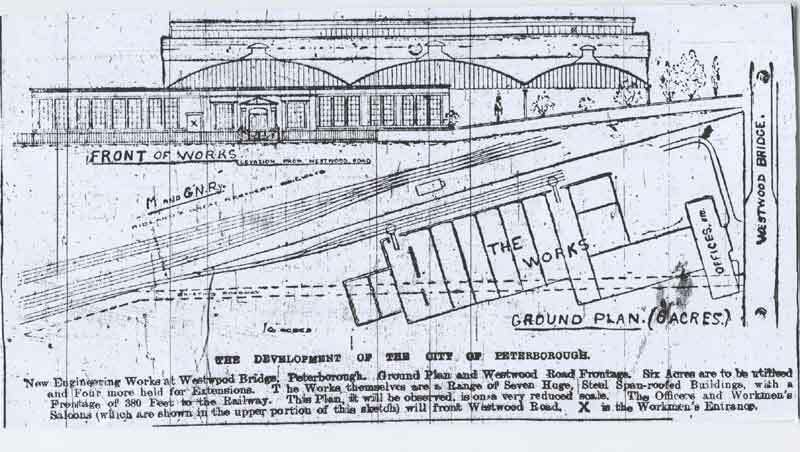 “We are indebted to Messrs Werner, Pfleiderer, and Perkins, Ltd for information, teeming with interest for Peterborough and District, regarding their new works at Westwood, which were commenced last week and which will revolutionise the trade of Peterborough – or rather, perhaps, it will be the first great step in its evolution, since the very fact of such a firm transferring their works to the City must almost inevitably lead to the settlement of others, and now that the boom has started so auspiciously, who knows where it will end? I found Messrs Werner, Pfleiderer, and Perkins’ offices, writes our Special Commissioner – by the way, the second name is easy enough if the initial letter be dropped – in Regent Square, off Gray’s Inn Road, snugly ensconced amid grimy, but large-rented, residences, and in the densest London fog of the winter it was the only bright spot in the square, with the windows gleaming with electric light and showing cosy rooms. As the Chief of Staff, on whose desk was a solitary newspaper, and that the “Peterboro’ Advertiser” wheeled his chair round, he looked every inch the shrewd English man of business, and yet there proved to be with it a culture and courtesy which one does not always meet with in busy City men who run great businesses. In the room was also Mr Baskerville, the tactful and genial young Peterborough manager, who first came to Peterborough as the envoy of the firm, and who, when the works are opened, will control things locally. The genesis of this Peterborough movement? Well, we saw an advertisement in the “Engineer” describing some land at Peterborough as suitable for engineering works. We were in negotiation for two or three places, and tried Peterborough, because it struck us as a place handy to get at, although, as it was almost devoid of anything in the engineering line, we hardly expected to find it all that we could wish. When our Representative got there he found that the advertised land was not suitable for our purpose but he was shown this site along Westwood Road, and that seemed to Mr Baskerville to be just what we required. We ascertained that it belonged to the Ecclesiastical Commissioners, approached them, and, after rather lengthy negotiations, we got over the difficulties and purchased, getting possession at Christmas. We have secured ten acres in all, but four will be left as allotments in view of extensions. You see by the plans that there will be a siding running alongside the works of about 1,300 ft and a sorting siding. Roughly speaking, all our imports will be raw material, and we shall practically manufacture everything we want. What do we make? Machinery for certain industries, principally chemical; bakery equipment, heating and ventilating apparatus, and so forth. We don’t touch general engineering at all, we confine ourselves exclusively to our own specialities. We are the originators of everything we make. What is the history of the firm? Well, you have to go back to the early years of the last century. At that time Mr Angier March Perkins invented a system of heating, still known as the “Perkins’ Small Bore System” and he was practically the first to provide means for heating buildings and large establishments from a common centre instead of by fires, from that centre he heated, by mechanical means, the whole of the building. From that he went into many things; he and his son had exceptional talents for the development of new ideas, but they were more interested in the development of the idea than in the commercial working of it. The name of Perkins is universally known today as that of the inventor of this system of heating and as the originator of these developments. His grandson, and the father of one of our present directors, was Mr Loftus Perkins, who died in 1898. He is even better known as an inventor than his grandfather, and was the first to advocate the use of the very high pressure of steam in engines, together with superheating of the steam. That is an epoch-making fact, which has practically dictated the modern development of the steam engine. He was the father of the water tube boiler, and while he absolutely demonstrated the soundness of all his theories, he was far too busy setting forth new ideas, ever to work them commercially – that is being done today by some of the great engineering firms of the country, who are profiting by his experiments. 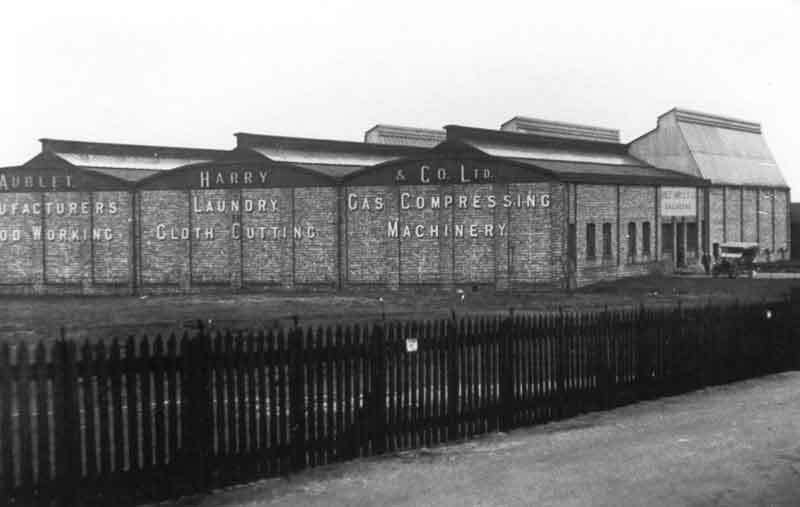 We had on these premises until a short time ago – when they were cleared away because we wanted the room – the engine and boiler on which Mr Loftus Perkins demonstrated his theories. 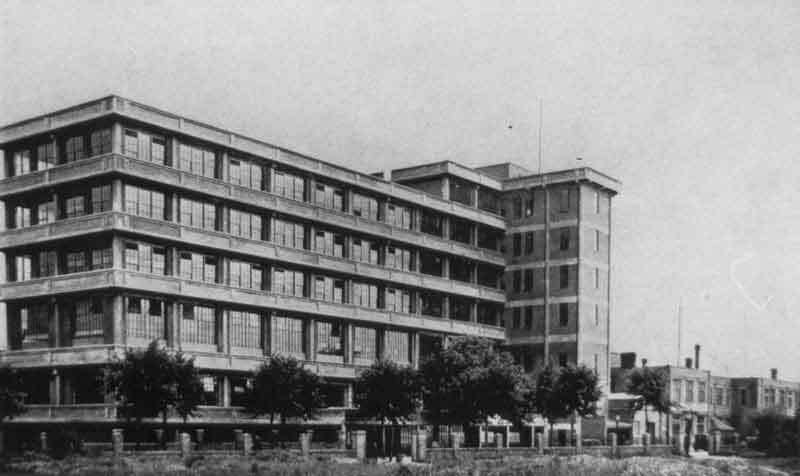 Engineers took the greatest interest in these new developments, a comfortable room was provided for them here while they watched the experiments, and to them Mr Perkins simply gave away everything he found – he did not care tu’pence what became of the thing – once he had solved the difficulties it lost all interest for him, and some of the difficulties he overcame were tremendous. He found the solutions for problems which even today are not generally recognised as feasible, although he showed that they are perfectly feasible. For instance, high steam pressure as commercially used is about 350 lbs to the square inch, which is commonly reduced in the engines to 250 or 300 lbs, but he used to work calmly and regularly at 500 or 600 lbs to the inch. That’s an unheard of thing today, but bit by bit they are getting to the point at which he left off, for he was actually working at that pressure. These premises, where he worked and experimented, are amongst the few places in London that can rank, in historical interest for the technical world, with the scenes of the labours of such men as James Watt and John Penn. While at this work Mr Perkins went off at a tangent and invented a system for cooling things without any mechanical appliance whatever, and over that refrigerating idea he killed himself. He was a man of tremendous physique, and with a charming disposition, but he overworked himself and died some fifteen years ago. They were a remarkable family of technical minds – the grandfather, his son, Mr Jacob Perkins, who continued his work, and Mr Loftus Perkins, who broke out as a fresh genius, and was the man who made the name one of world-wide reputation. He it was who developed the Perkins’ tube for obtaining very high temperatures by mechanical means, the high pressure steam boiler, the engine with super-heating, and the refrigerating system. A few years after his death Messrs Werner and Pfleiderer, who recognised the value of the inventions, entered into negotiations with the present Mr Perkins, and the result was the amalgamation of the two firms in 1893. Mr Pfleiderer was also a remarkable man from a technical point of view – an original thinker, and his name is one of the best known in connection with certain specialities. After the amalgamation, the business began to develop for certain clearly defined specialities and the result of the combination of the inventions of the two firms is that today its business is done in specialities which were entirely originated by the firm or its ancestors. Running back for a considerable distance behind the London offices are the works of the firm, and it was not a little surprising to be shown workshops and great machines and mechanics hammering away in the heart of London and near a street where their presence would be least suspected. A great gas engine, with the harsh bronchial cough with which gas engines are occasionally afflicted, was coupled with a big motor, and scattered over the works were smaller motors. Men were perspiring before a fire in the smithy, and one wondered that nothing was heard of the sound of the hammer in the street. Completed, or nearly completed, appliances were here, there and everywhere; at one side one found a mighty oven for a big Atlantic liner, at another a heavy kneading machine, and so forth. These works, it was explained, will be entirely transferred to Peterborough; at present they are seriously handicapped by want of space. There are other works at Wellington, Salop, and as soon as the first instalment is comfortably settled – that is in about two years’ time, certainly not longer – those from Wellington will be brought to Peterborough too. 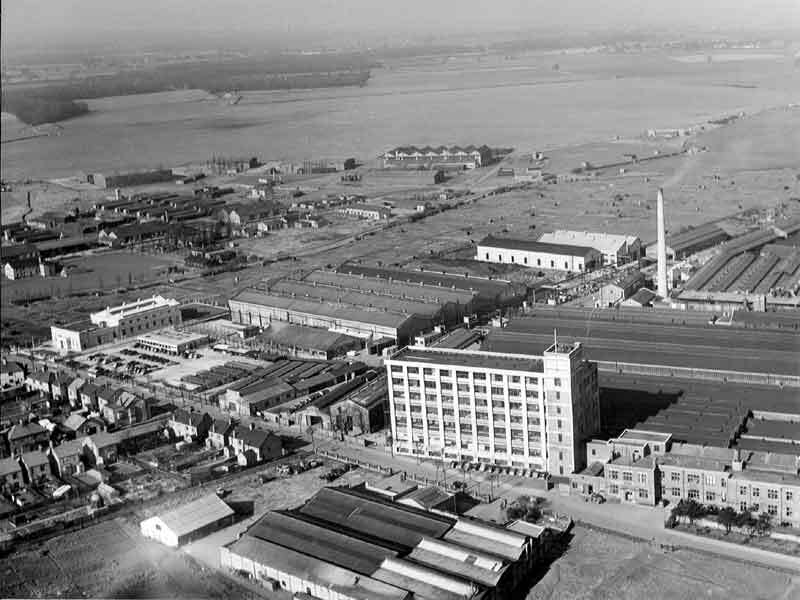 The shops put up in the first instance will make provision for the Wellington men coming in, but before they are transferred an additional building will be erected as a foundry, which is not included in the present contracts. 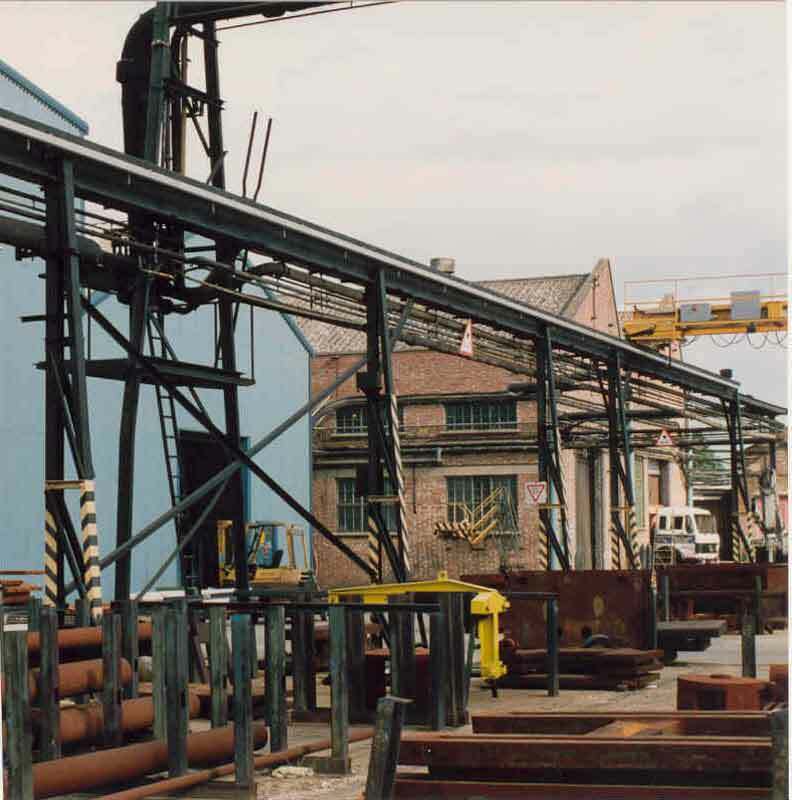 The foundry, for the production of castings, will be the only addition which will have to be made when the second section of the works is removed to Peterborough. In the meantime, the castings will be obtained from Wellington. The offices and headquarters will remain in London. How many men do you expect to employ at Peterborough? We employ from 300 to 350 men now, but we hope to increase that number very largely as soon as we have facilities – we could have increased the number very much in the past if we had had the facilities. Of course, these men are not all visible at the works, we employ a very fair proportion on outdoor labour; gangs of men are continually going about the country. Any probability of Peterborough men being employed, do you say? Every probability if they come up to expectations. Yes, we shall employ local skilled mechanics if they are worth their salt. The weekly wage bill will run into three good figures. 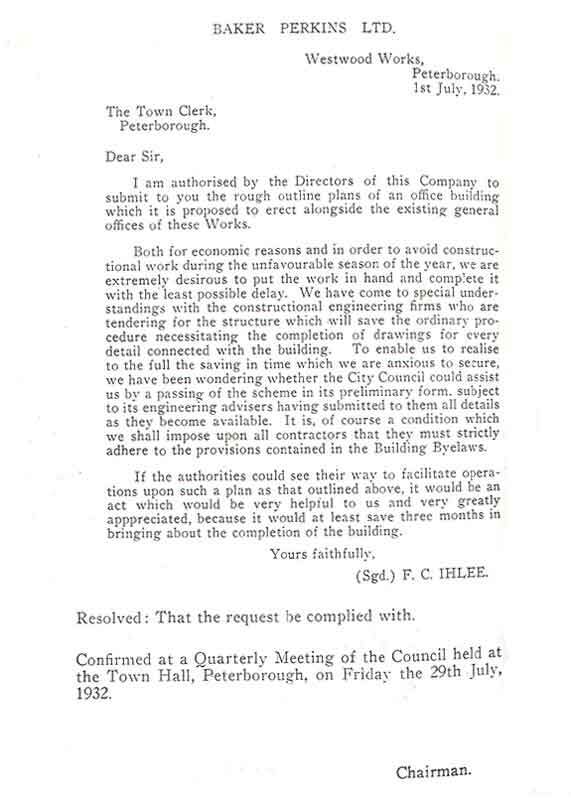 No, we shall not attempt to do any house-building at present, because we find that there are so many enterprising builders at Peterborough that it will be unnecessary for us to build. The works will be of an absolutely up-to-date description, and every provision will be made for the health and comfort of the men, but no money will be thrown away on architectural frills and furbelows. The men will have cloakrooms and wash-houses where they will be able to change on coming into the works and clean up on going out. 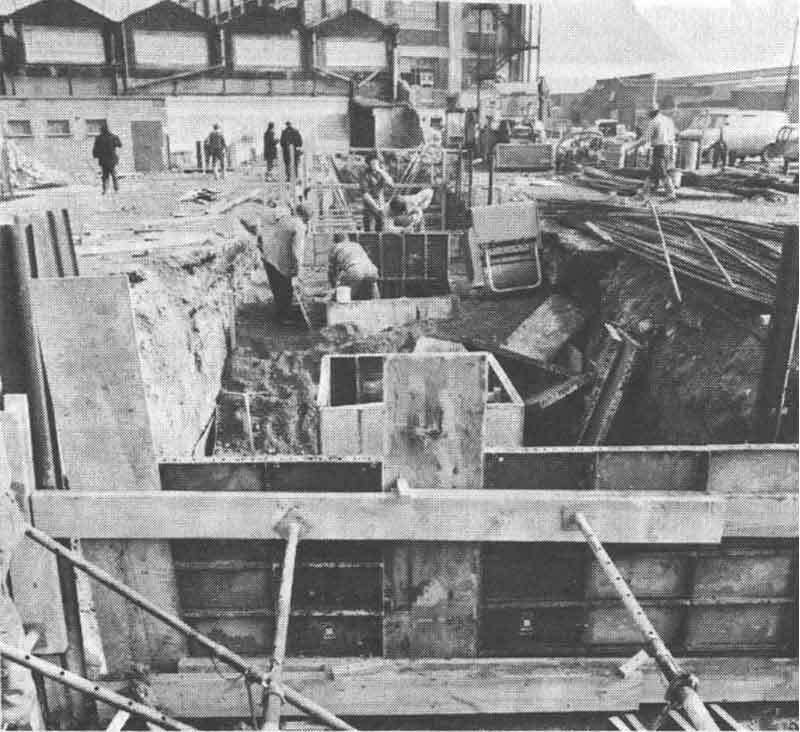 There will be a basin for every four men, operated from the offices, so that there can be no possible waste of water – one valve will be opened and by that means the water will be set running for a certain length of time, during which all the men must use it, and the basins will be continually filled with fresh water. The sanitary arrangements are in the hands of the London Sanitary Protection Association, and will be of the most perfect and up-to-date description. There will be a separate locker for each man, in which he can keep his clothes. In short, the works will be as perfect as they can be made, and one would have to go a long way to find an establishment which will beat them. A great deal of money will be spent in providing what the firm considers to be a necessary part of the proper equipment of works in these days. What we want to do, said the manager, is to get the men to appreciate the fact that we are making every provision for giving them the best possible conditions under which to work, where they can rely on healthy, comfortable surroundings as well as hours and everything else, and in return, we want them to give us a healthy, comfortable day’s work. An attempt will be made to start work after an early breakfast with only one break – at mid-day. All men will be employed on “piece work”. Mr Cracknell, of Peterborough, has been given the contract for the brickwork of the main building, and the other contractors are: Mr H. Handyside, of Derby, for the steel work; Messrs D. Anderson and Sons, of Belfast, for the roofing; Stuart’s Granolithic Stone company for the floors; Messrs J.H. Andrew and Co. of Stockport, for the gas engines, and the International Electrical Engineering Company for the electrical equipment. Power will be derived from a central station provided by a 275 horse power gas engine, driven by producer gas and directly coupled to dynamos. The whole distribution of power and lighting will be by electricity – 230 volts. There will be a granolithic floor, and, of course, different departments for different stages of the work, with ample store and warehouses. What chiefly induced you to come to Peterborough? In the ordinary way, we should look rather askance at a Cathedral City, because as a rule they are so slow – I don’t mean that as an insult to the people of Peterborough, but merely speaking of the smaller Cathedral cities generally. Oh, we take it as a compliment that we are not like other Cathedral cities, and for that reason you are coming amongst us? Yes, it is a compliment, and I cannot speak in sufficiently high terms of the way in which everything has been done to smooth the way for us. That is certainly one of the chief reasons why we are settling in Peterborough. We look upon you as representing the city and we are glad to give you all the information we can, as some slight acknowledgment of the kindness we have received. We are very much indebted to Mr Mellows for the very ready way in which he has always assisted us and supplied us with information – he has done all he could to get difficulties out of our way. We are grateful, too, to the City Council for the business-like way in which they have settled such questions as drainage, water and plans – there has been no waste of time, no dilly-dallying, as in some places. We shall be very pleased to do what we are able to, to direct the attention of other firms to Peterborough, and we shall never miss an opportunity of saying a good word for it. We are Peterborians now, you know, and have the interests of the city at heart, added the Director, cheerfully! 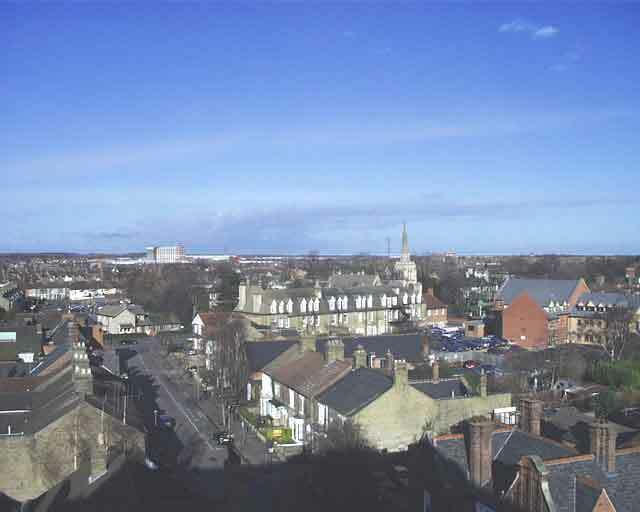 Do you look upon the commercial prospects of Peterborough as rosy? I don’t see why they should not be. As far as possibilities are concerned, I think they are pretty well unlimited, and far greater than those of the average town. You have a capital railway service up to town, frequent, fast, and comfortable, you have natural advantages in the nature of the sub-soil and the flatness of the surface, which are important considerations, and you have land which can at all events be got at a reasonable price. Therefore, the select ion is always great, and the price is not likely to be rushed up. Anything like a landlords’ ring to put prices up would be fatal to the introduction of any enterprise, and if the Corporation could only manage to do it in some way, it would pay them, on behalf of the city, to acquire all the available sites. We expect to start the Peterborough works in August of September, but it is rather hazardous to state the time, because you cannot ensure against unforeseen delays. Opening ceremony? No; you will find us to be unobtrusive people, and we shall start work quietly. “No silver key for me or any business of that sort” laughed the Interviewed as we shook hands." The railway can be seen to the right of the construction work, while what will become Westfield Road runs along the bottom of the shot. These photos clearly show the 1908 Office Block as a single storey building. 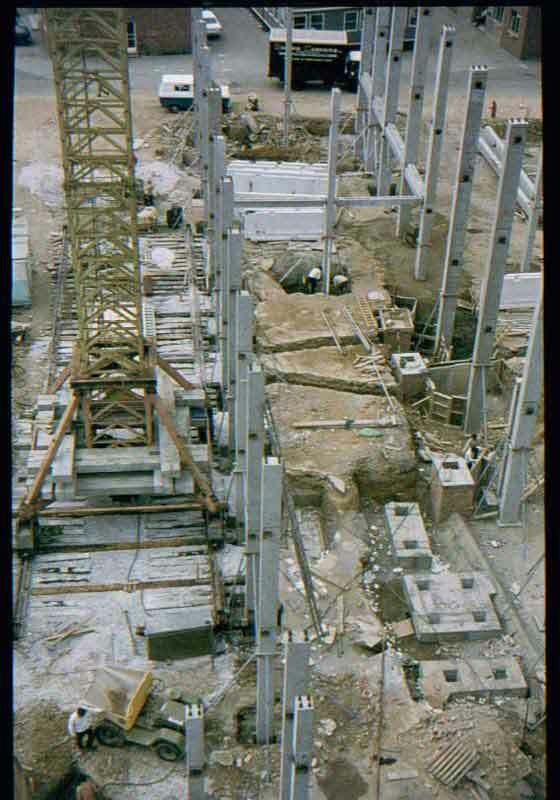 The first sections of the Machine Shop and Fitting Shop bays were in place. These were progressively lengthened westwards in 1915 and again in 1926. 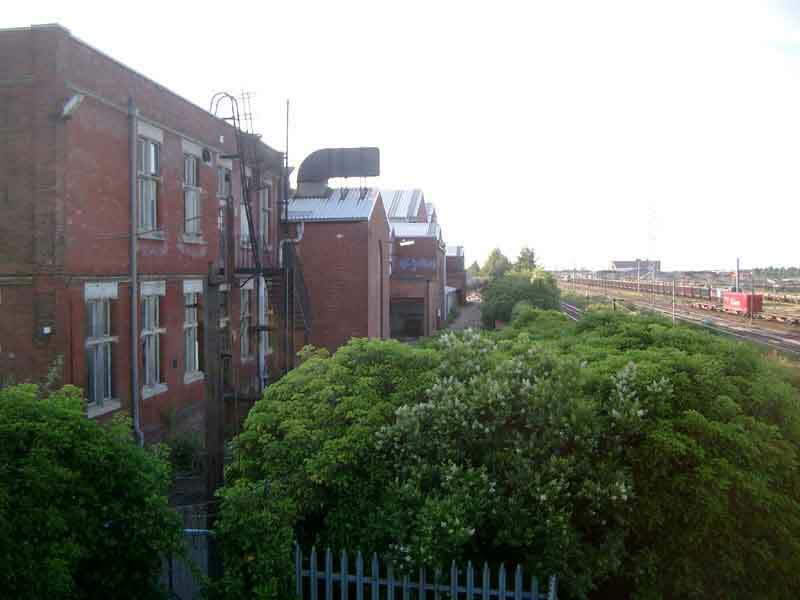 Some of the windows in the gable ends overlooking the railway can be recognised as having survived until the site was cleared in 2003. Showing the Directors' Garage next to the front entrance to the 1908 Offices. A second storey was added to these in 1918. 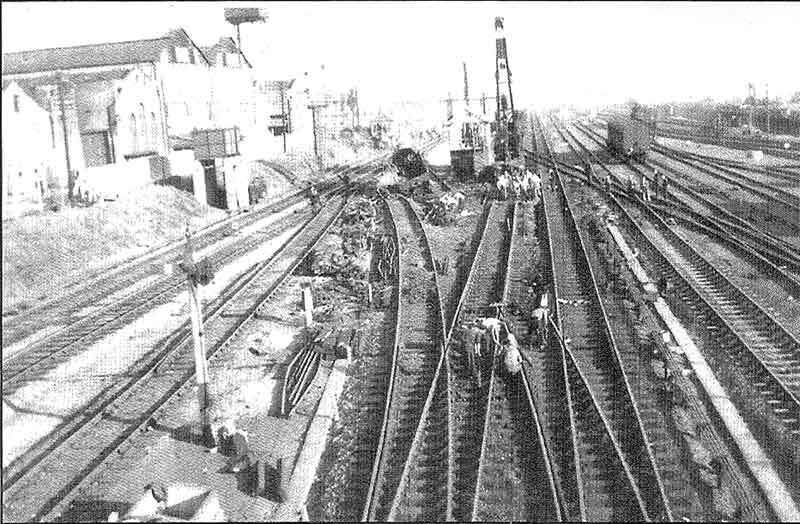 At this time, the Main Works Yard and entrance was sited between the Despatch Dept., later "Y" Bay, and the west end of the Machine/Fitting Shop bays. 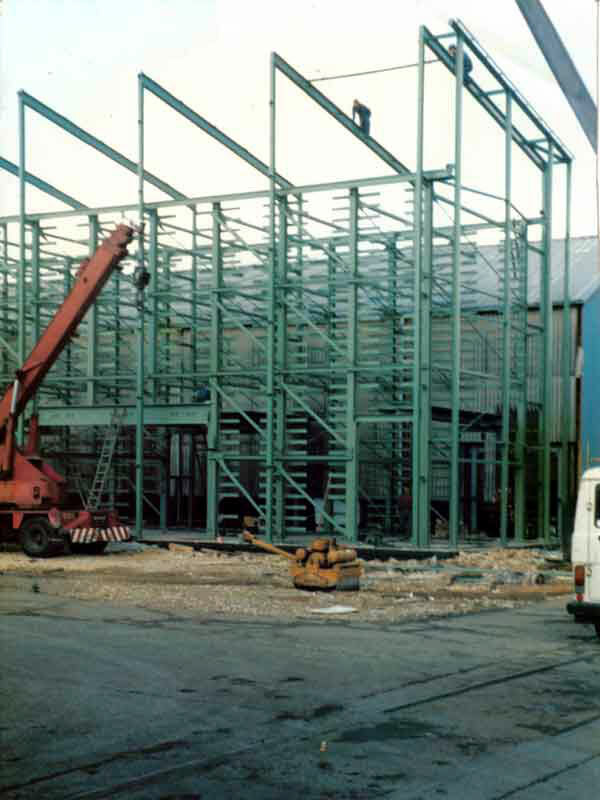 These photographs were taken before any of the Plate Shop bays were erected, to the west of the factory only allotments being visible. 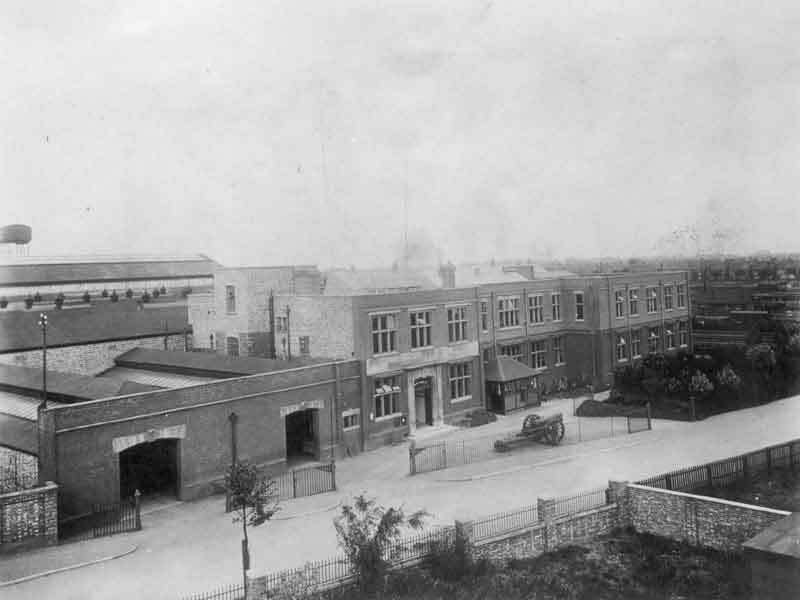 At the north end of the site, what came to be the Motor Vehicle Workshop, and Pattern Stores (Much later - Customer Services Workshop, Spares and Assembly) can be seen but not the Pattern Shop - not built until 1922 (and extended in 1929). By now the "Black Shed (erected in 1922) can be seen at the far north end of the site. 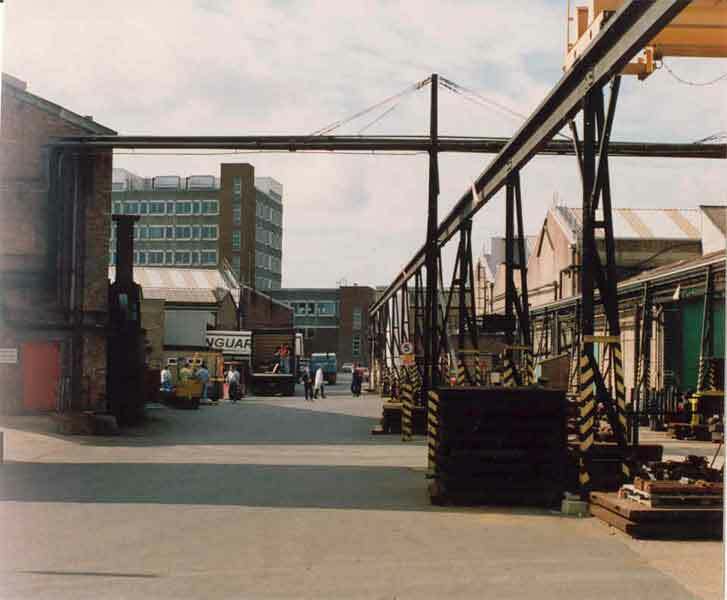 At the west end of the site, the Main Works Entrance had been moved to the other side of the Despatch Bay after the Machine/Fitting Shop bays had been extended in 1926.The first of the Plate Shop bays were built in 1935 (P2 and P3 bays) - the L70 bay was added in 1938 and P4 not until 1946. 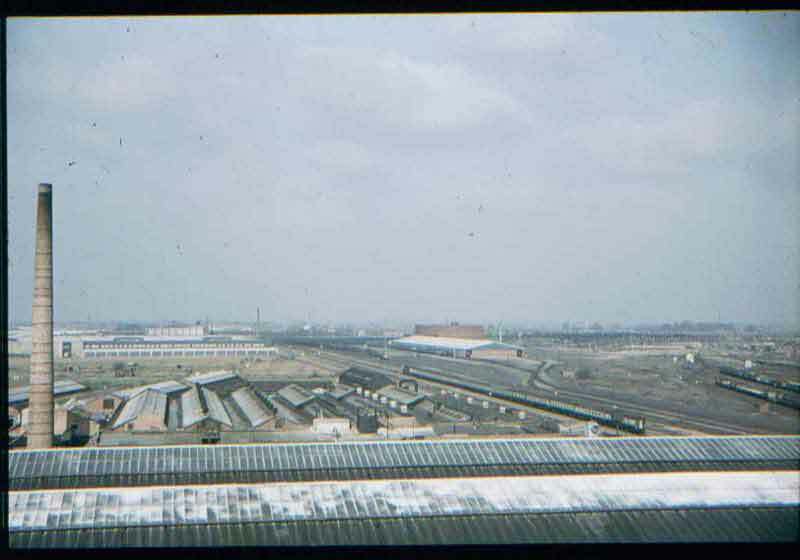 To the west of the factory there are still allotments but RAF Westwood can clearly be seen. This was opened in 1932. 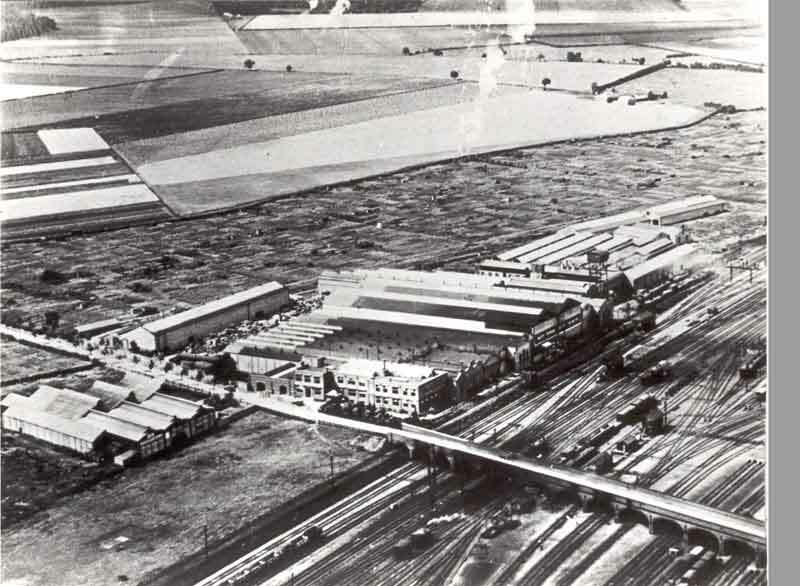 The Airfield was placed under care and maintenance in 1948 but for two years, British Airways used it as a helicopter base for a regular mail service. 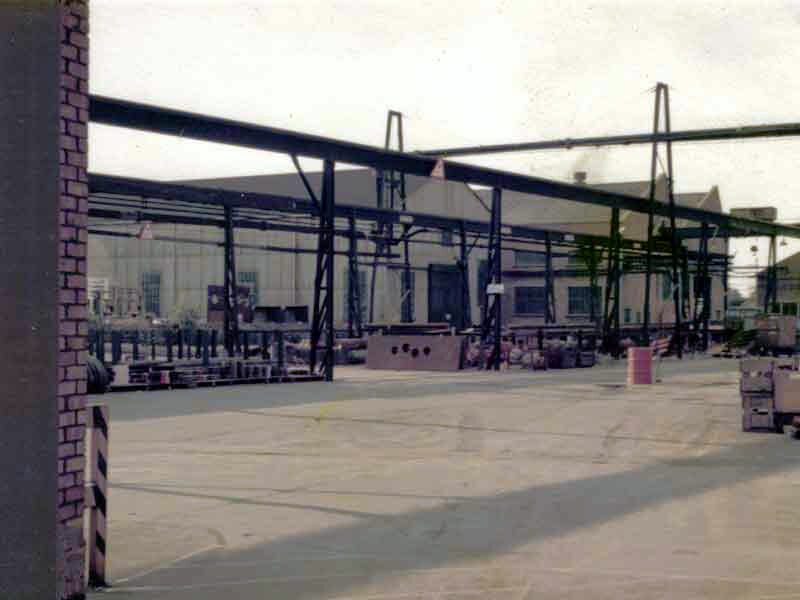 From 1958 to 1963, Baker Perkins, Mitchell Engineering and Mitchell Construction used part of the Airfield and remaining hangars to house their Company Aircraft. Another superb aerial shot of the site (kindly loaned by Bob Woolley). 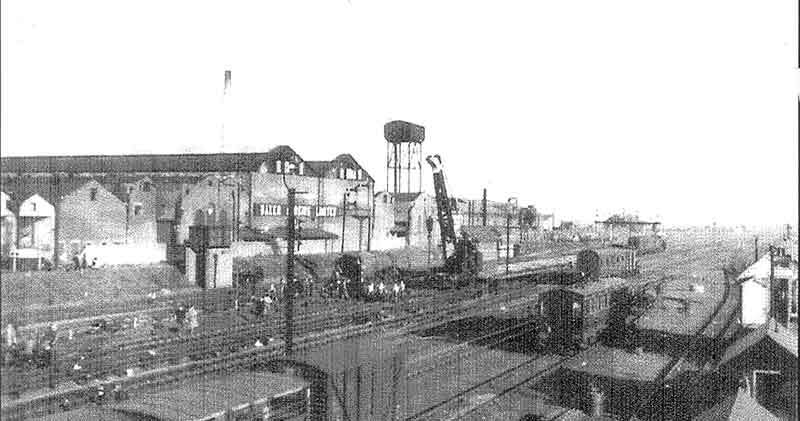 It is relatively easy to date as it shows the first bay of the new Experimental Department (completed in 1949), but there is no evidence of the Boiler House and chimney (built in 1951). By the time that this photograph was taken Westwood Airfield had been in a "care and maintenance" state for two years and, but for the absence of any aircraft or vehicles, still looks in very good condition. The verandas are still in evidence on the 1933 multi-storey office block - it is thought that these disappeared in the mid to late-50s. There is an impressive number of railway wagons in the company sidings and allotments cover more of the site than do the manufacturing facilities. A particularly fine shot showing the broad expanse of RAF Westwood still intact but devoid of activity. The afternoon sun gleams on the brand-new Apprentice School and highlights all of the buildings along the Westfield Road frontage. The Plate Shop is now complete as is the Experimental Department. To the right of the Apprentice School can be seen the "Old" Canteen but the 2-storey Personnel building has yet to be built so the Surgery/Medical Centre must still be housed in the buildings between the Main Works Entrance and the Directors Garage - the open door of which shows up very clearly. 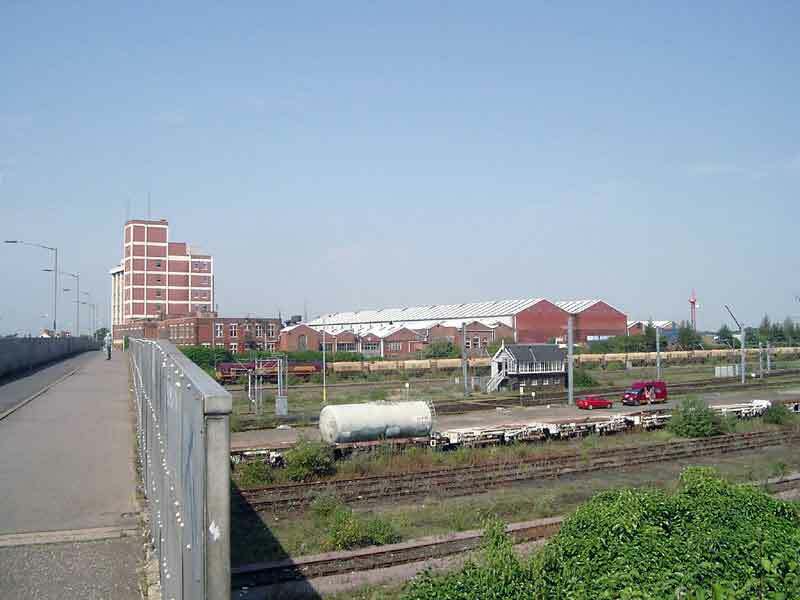 The Clocking-In Station and the Cycle Sheds are to the left of the Main Entrance.The areas used for Car Parking - in front of the multi-storey office block and to the right of the Apprentice School - are dwarfed by the space taken up by cycle sheds. 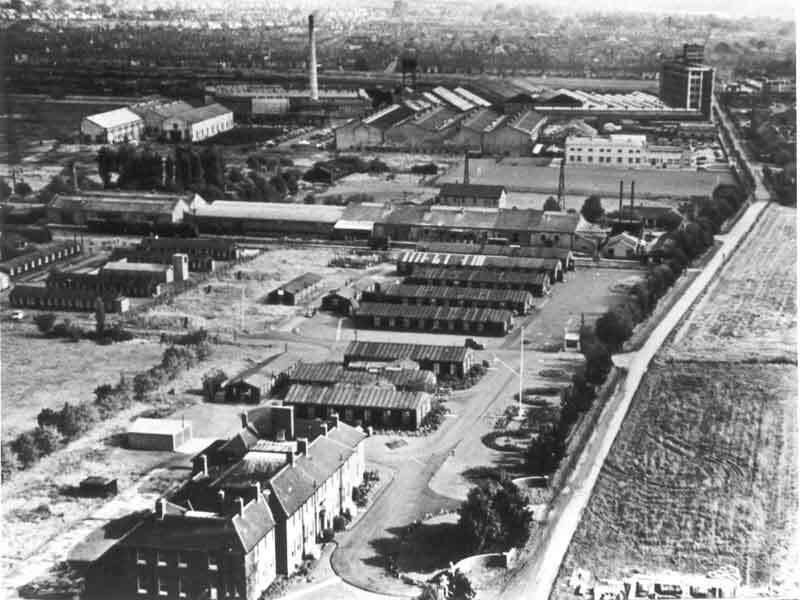 The accommodation for RAF Westwood is still in evidence but Westfield Road, and the housing on the right hand side has still not been developed. 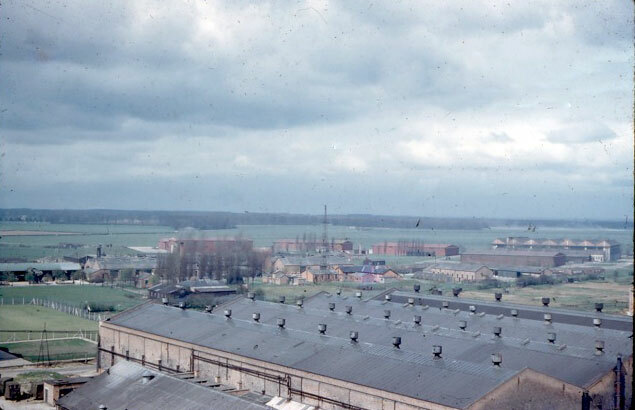 The Apprentice School can be seen in the middle distance (built in 1953), as can the new Boiler House and chimney which was erected in 1951. Alongside the Apprentice School can be seen the first Apprentices' Sports Ground. The first part of the Experimental Department (1949/1955) is visible in the top LH corner of the photograph next to the Marston Hut (1946). A view of most of the site which had by now grown from the original 10 acres purchased by F.C. Ihlee in 1903 to over 40 acres, including the allotments in the northern-most corner. 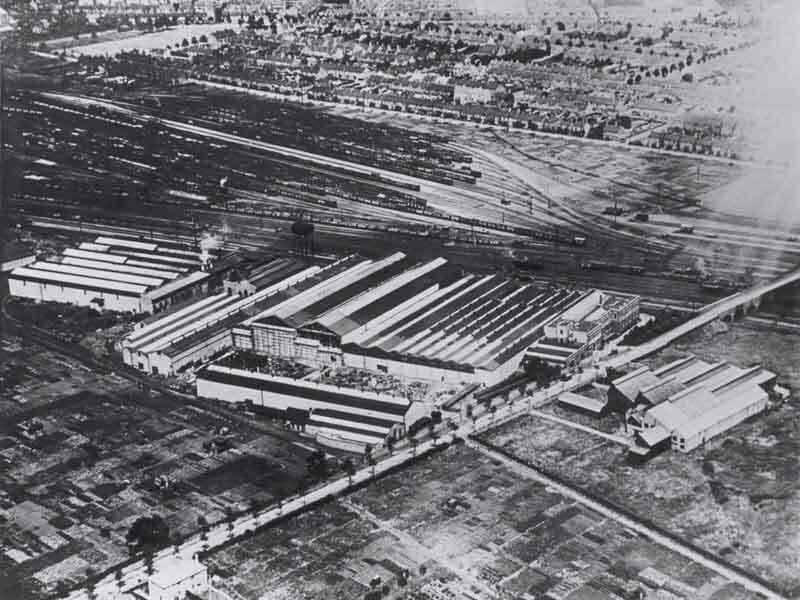 The site now filled virtually the whole area from Westfield Road in the south, to Freeman's warehouse in the north and from the railway in the east to the line of Saville Road in the west. A view of the new Apprentice School from the top of the office block. 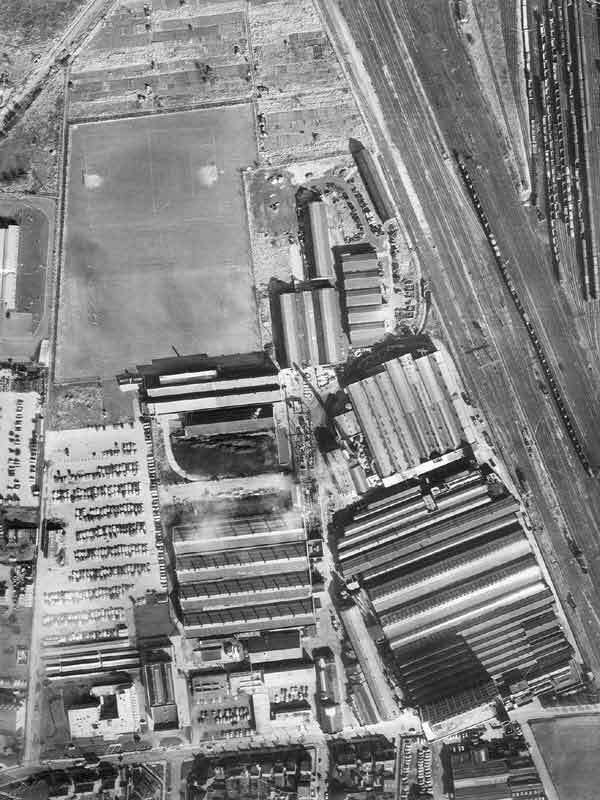 The first Apprentice Sports Ground can be clearly seen. 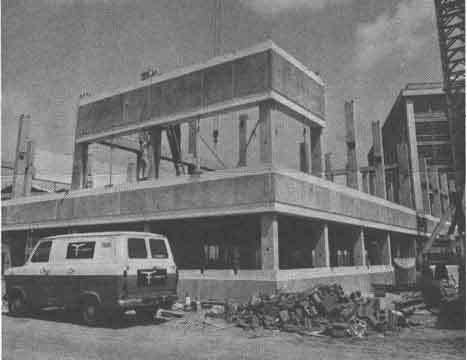 This side of the Apprentice School is the Orlit building, a pre-fabricated structure erected at the end of WW2 that, in 1954, housed the newly formed Chemical Machinery business. 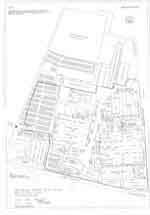 Work on the Netherton Estate had not then been started and there are only green fields between the end of the Baker Perkins site and Horrell's Farm and Longthorpe. 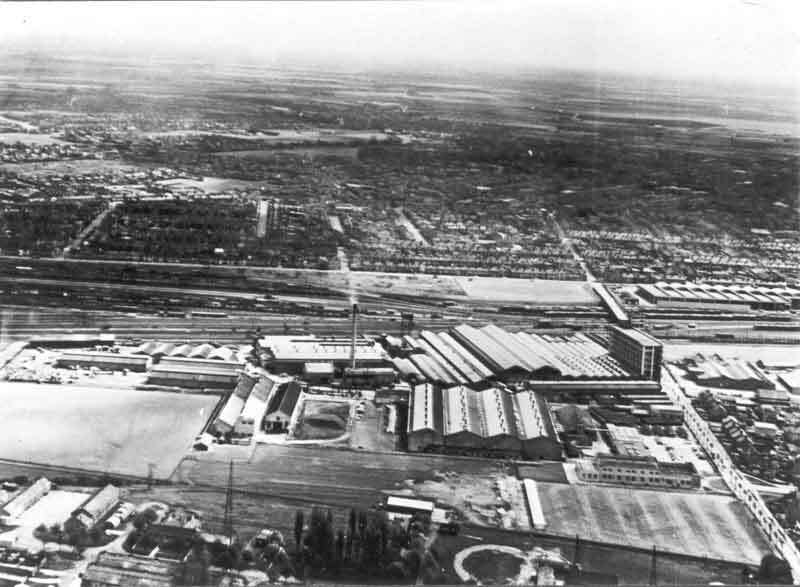 1955: Site View Looking towards the north from the same vantage point. Westwood Airfield occupies the area now taken by housing - Ravensthorpe and, in the distance, Bretton. 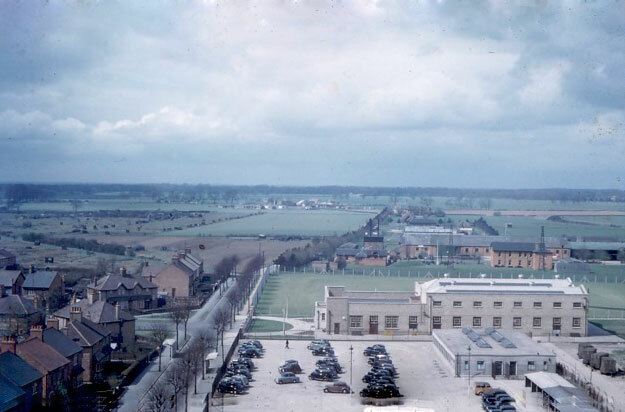 Prominent in the centre of this shot can be seen the "Old" Canteen (1941), with, between it and the Apprentice School, the 17,000 gallon water tank which was installed in 1941 to act as an emergency supply in the event of enemy action during WW2.Just to the right of the "Old" Canteen is the white, single storey Tarslag building. Another pre-fabricated structure, erected in 1958 and used for a number of purposes - as the Reception for the Personnel Department and, in later years as a Snack Bar/Canteen. 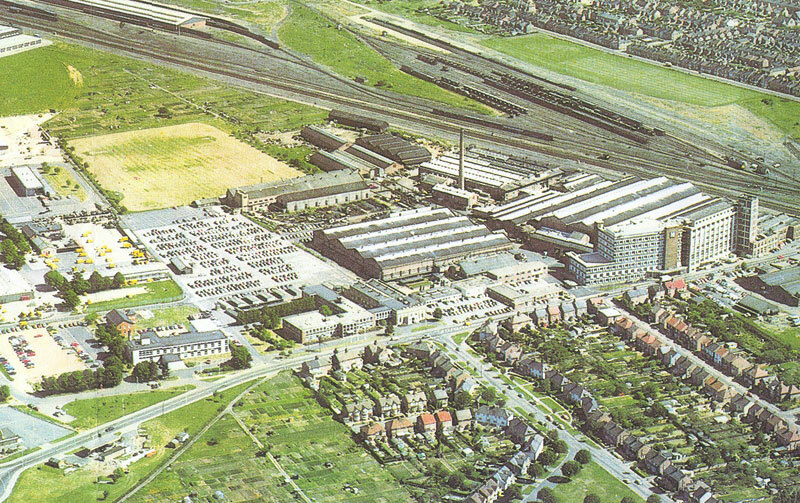 By this time the Holdings Building (1966), but not its overhead link with the Apprentice School (1970) can be seen. The two storey building in front of the "Old" Canteen is the Welfare/Personnel Block built in 1966, the ground floor housing the Medical Centre. The first Apprentice Sports ground has been moved to the north end of the site and the large Works Car-Park has been sited behind the Holdings Building. 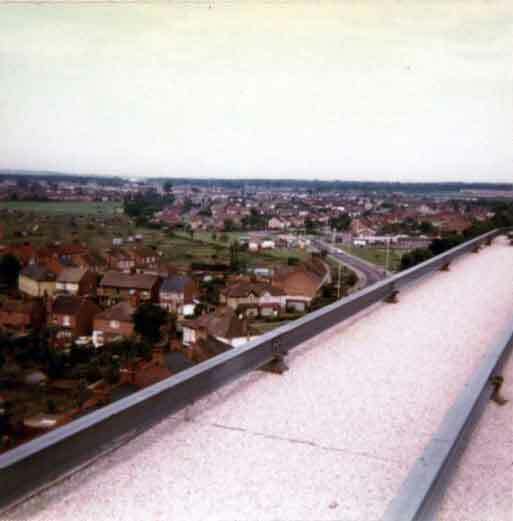 A vertiginous view of the whole site, taken at the end of the '60s. Westfield Road runs along the bottom of the picture. 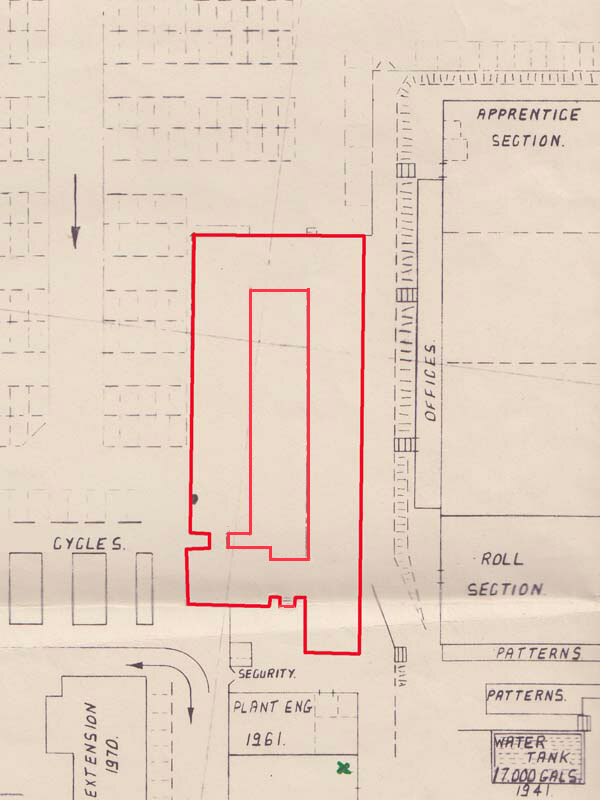 The shadow of the 1933 Office block falls across the Machine Shop and the cluster of buildings around the main Works Entrance (discussed below) show up clearly. Behind the Canteen and below the Plate Shop can be seen the large Static Water Tank. Another superb photograph taken facing north, with the remnants of RAF Westwood surrounded by Peterborough Development Corporation's Ravensthorpe housing development. 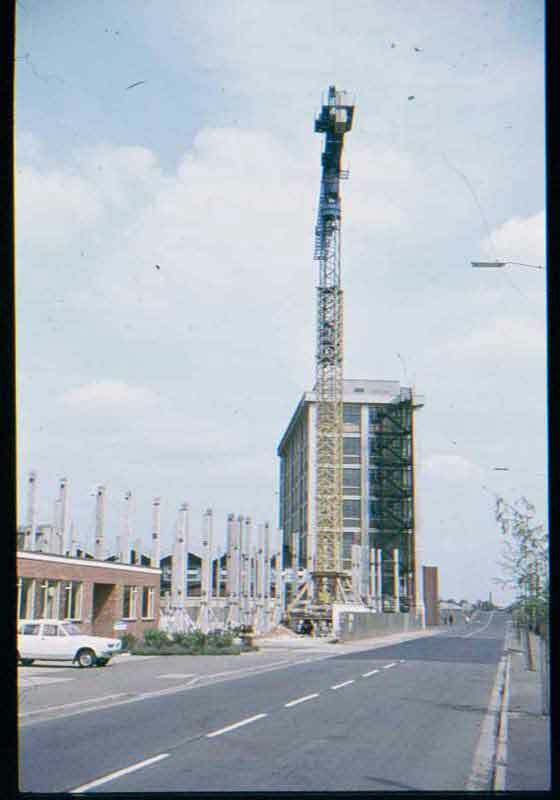 In the front LH corner of the picture can be seen the final arrangement of the cluster of buildings which fronted onto Westfield Road prior to the erection of the 1975 7-storey office block. 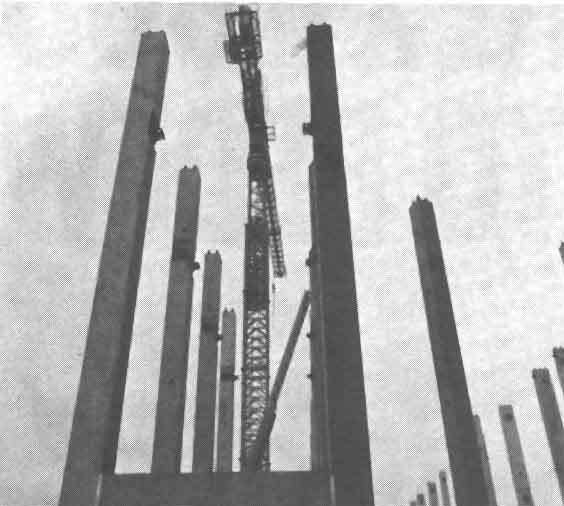 This photo must have been taken after 1966 - when the Holdings Company building was built - and before 1970 - when the overhead link between the Holdings building and the Apprentice School was created. There is no sign of the "Elliott" buildings - used as temporary accommodation for the newly formed "Bismark" operation. This would confirm the date of the photograph as early 1969. 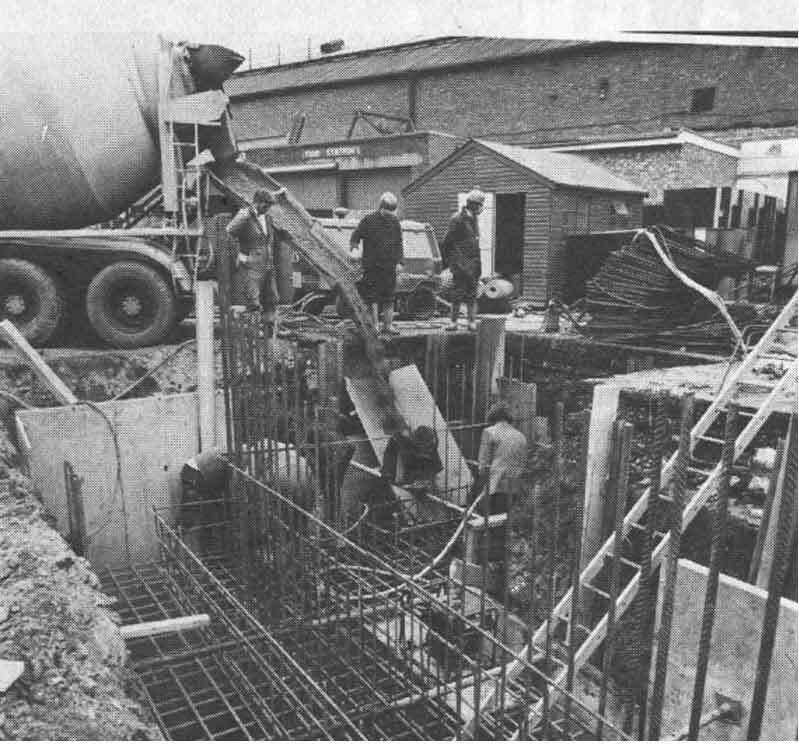 Shows the Main Works Entrance prior to building the 1975 Office Block. 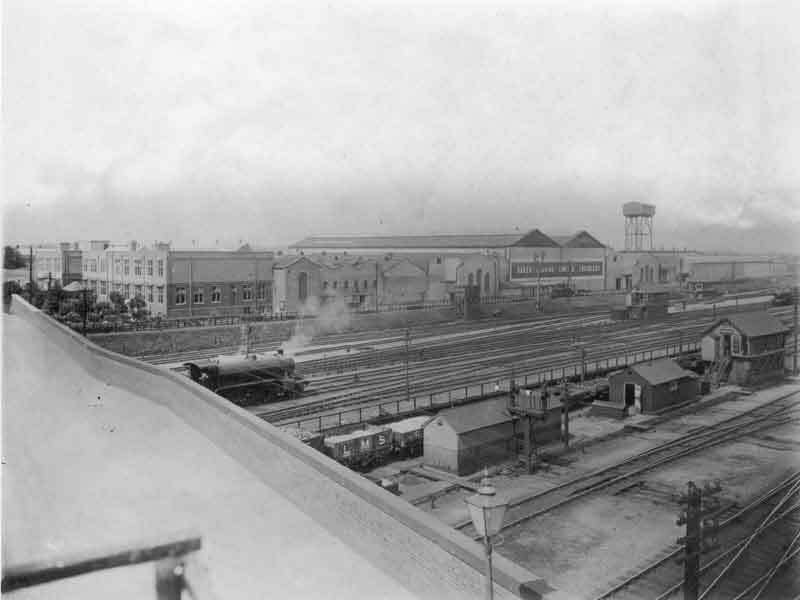 The roof of the "Old" Canteen and the 2-storey Welfare Building are in the lower RH corner. The Despatch Dept. 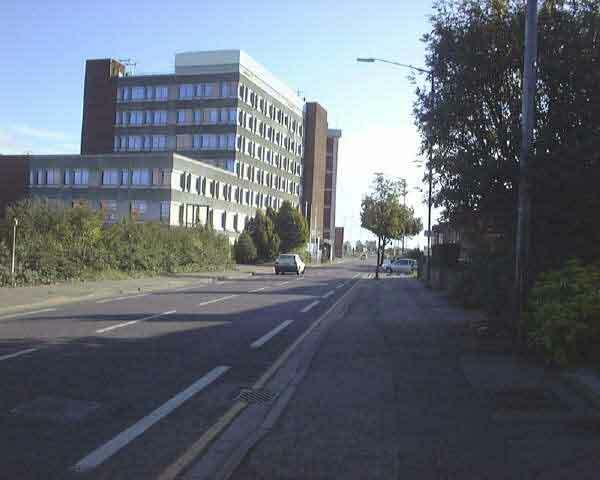 ("Y" bay) is to the centre left with a cluster of buildings that housed the Sports Club Office, Medical Comforts and Hairdresser to its right. The red door of the Fire Station can be seen at lower centre. 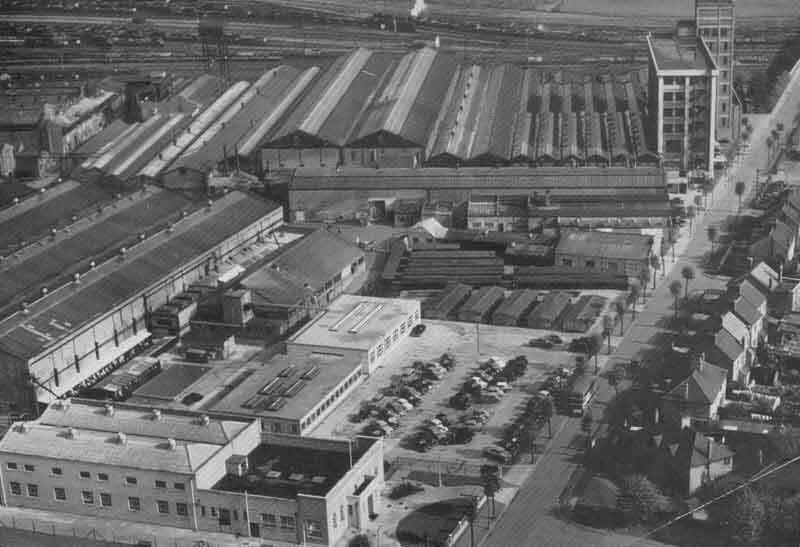 The building with the white patch on its roof at centre left was the Spares Office, with the Spares Stores behind it, This building was, up until the early '50s, the Clocking - in Station. 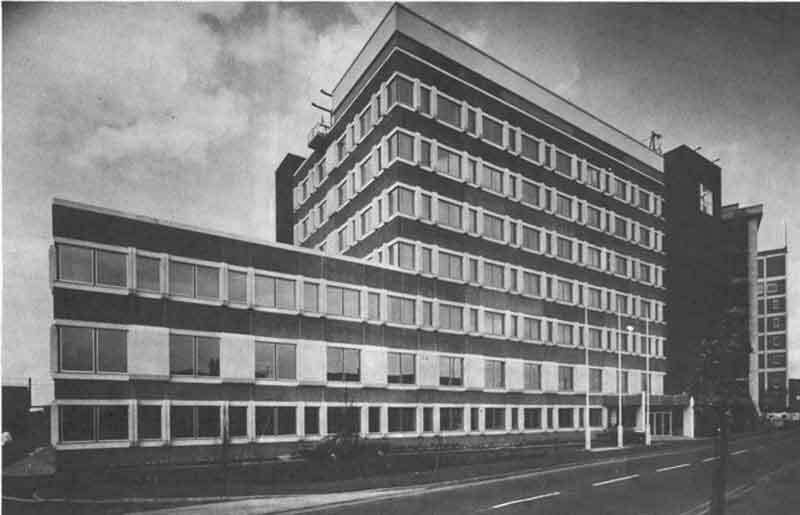 The "L" shaped building to its right, dating from 1963/64, fronting onto Westfield Road housed the Printing Division before it moved in to the 1975 Office Block. 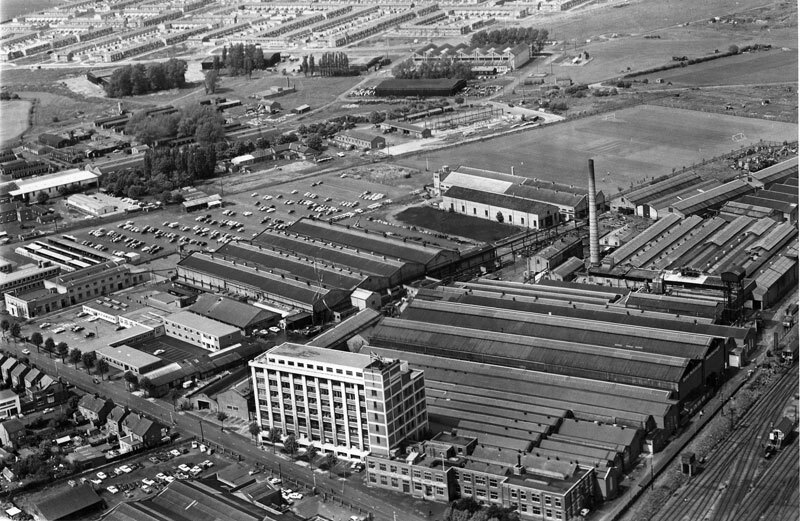 1975; Aerial View of Site The writer has very good memories of the three years spent in the "Black Shed", the temporary accommodation erected in 1969 behind the Apprentice School to house Baker Perkins' first dedicated marketing organisation - "Bismark". 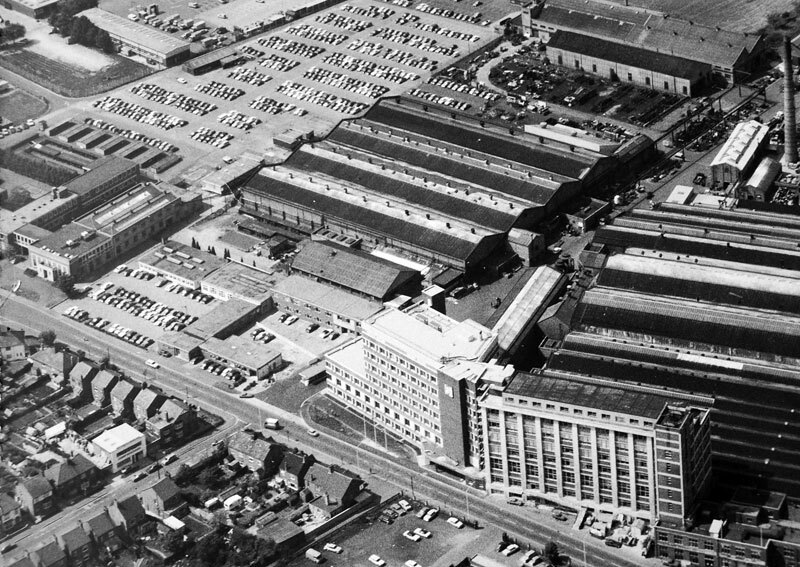 Unfortunately, we have only one photograph of the interior - see here - but close examination of a recently acquired aerial shot of the site (see 1975: Aerial View of the Site on the left) appears to show the first part of the sales office accommodation in situ with building material together with another section of the "Elliott" building sitting on the Works car park. 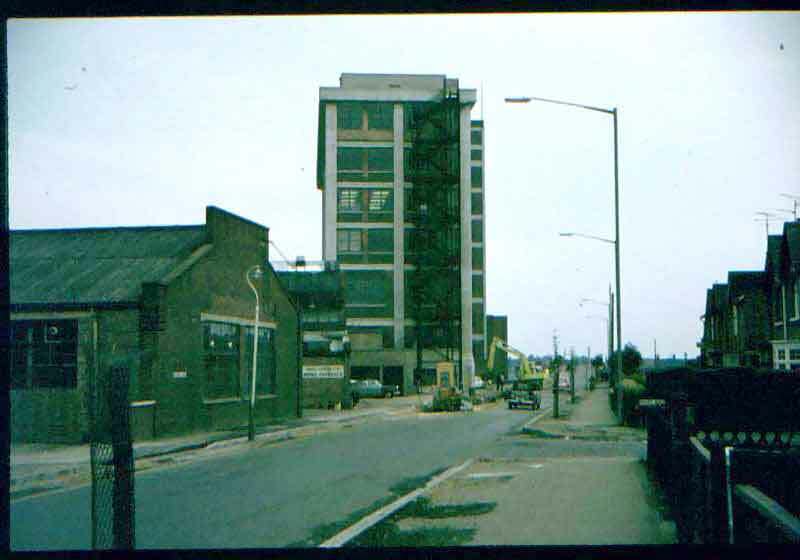 It had been thought that the photograph showed the erection of the "Black Shed" but the presence of the second multi-story office block (built in 1975) confirms that the shot dates from 1975 and therefore shows the demolition of the "Bismark" buildings. The Biscuit Division personnel will have been re-located on the 4th floor of the new office block. 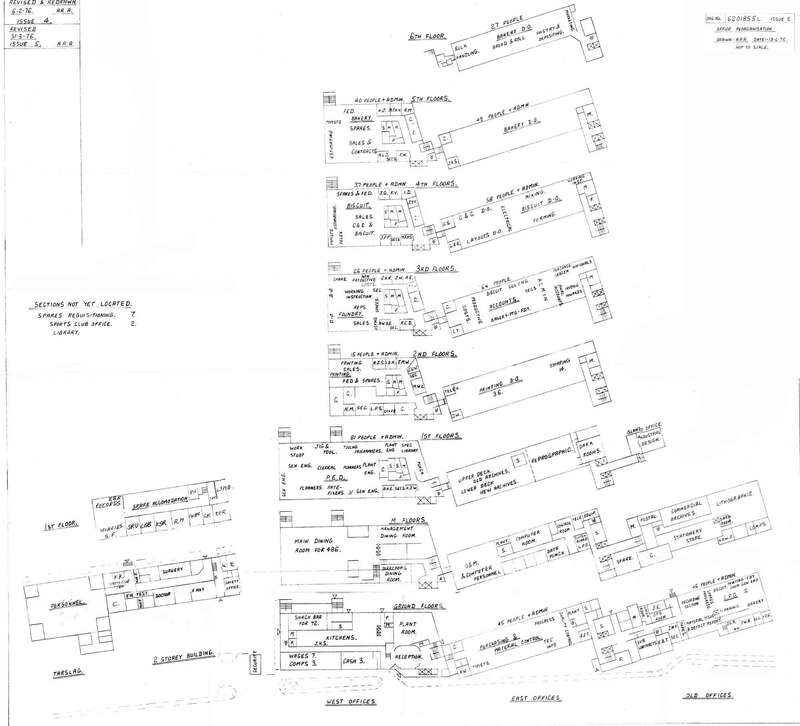 1975 Site Plan In the absence of relevant photographs of the exterior of the building, we have to fall back on a site plan which shows the arrangement of the Elliott buildings. 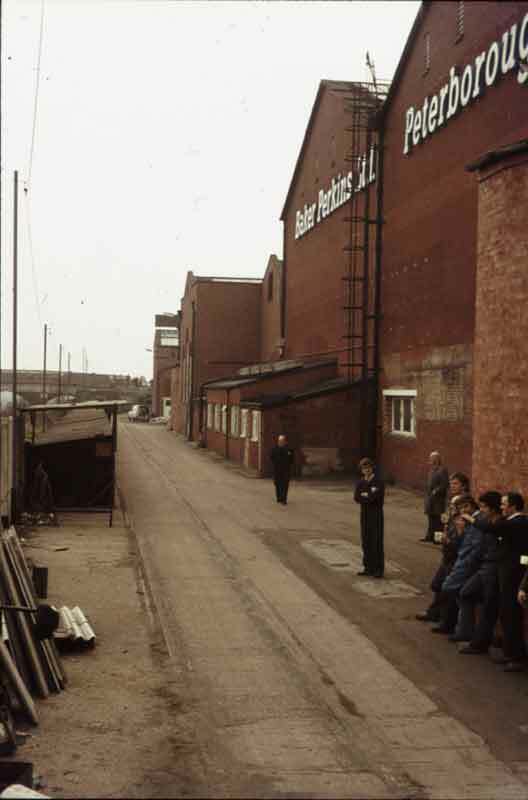 The entrance to "Bismark" was behind the rear end of the Apprentice School, the Drawing Office being located in the left hand wing, the Management, Sales and Marketing personnel occupying the right hand offices. 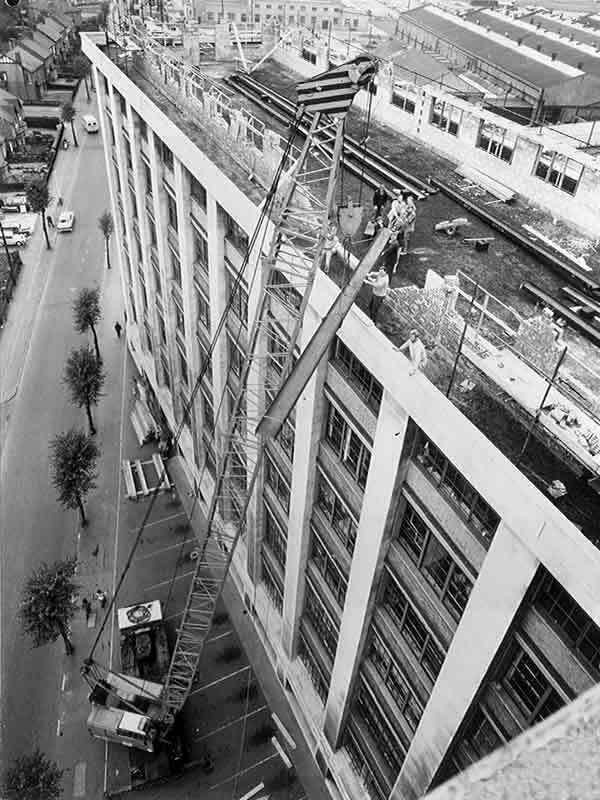 A superb aerial shot probably taken soon after the 1975 Office Block was completed. The car park to the West of the site has not yet encroached on the Apprentice Sports Field. 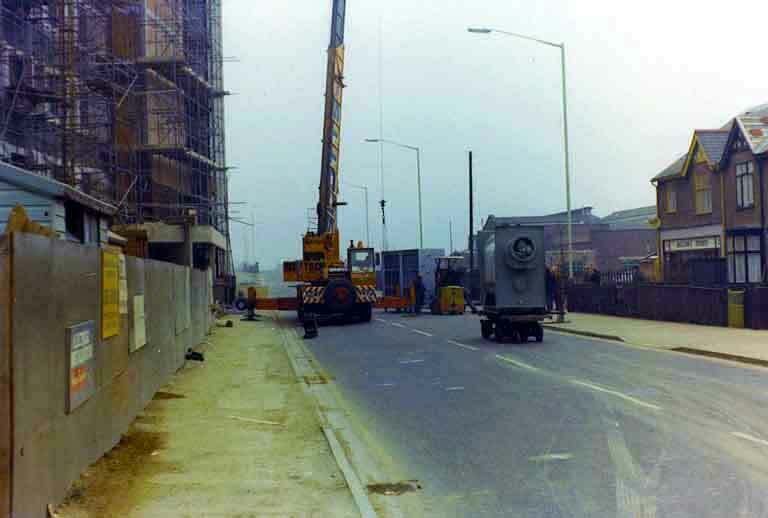 The photograph shows clearly the 1970 additions to the rear of the Holdings Building together with the bridge between the Holdings Building and the new Management Training Centre above the entrance to the Apprentice School. 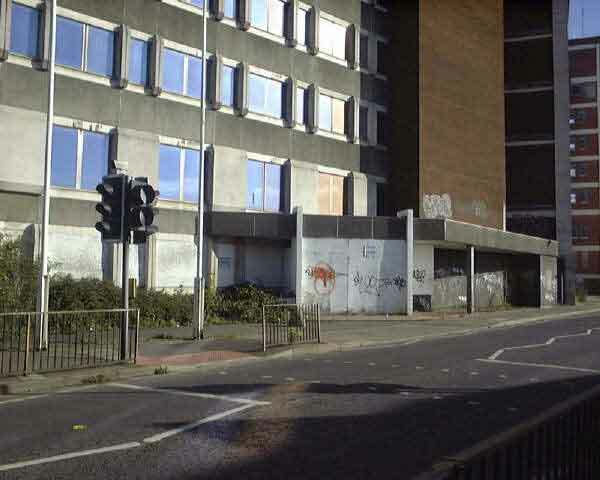 This shot shows the full extent of the Westwood site just prior to closure. 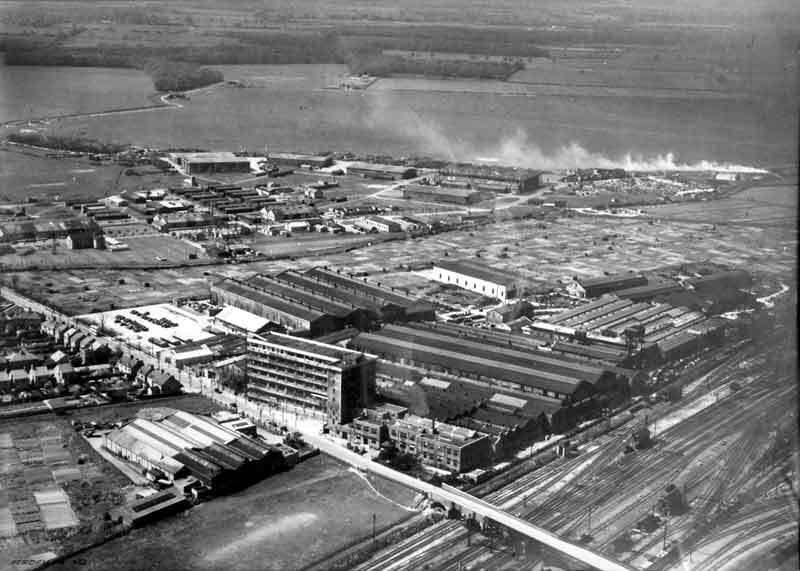 The site now covered more than 40 acres. The Main Car Park fills most of the west side of the site, the Apprentice Sports Field having been progressively pushed back over the years to the northernmost end. 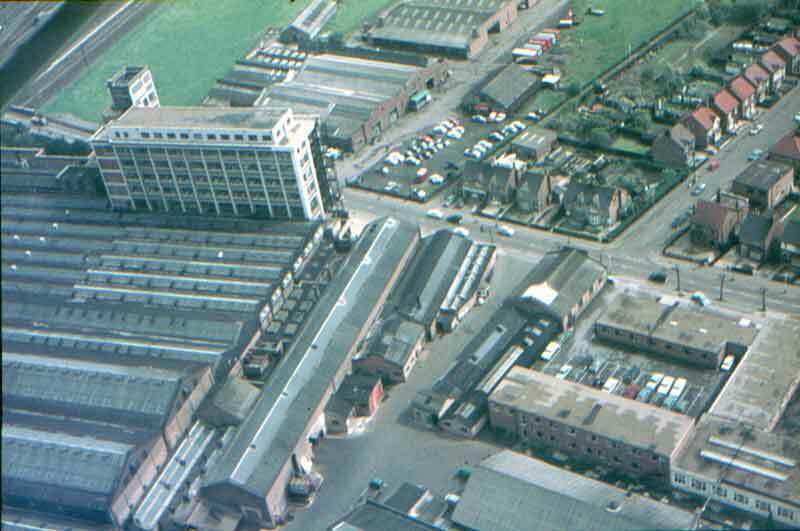 The Pattern Shop can be seen to the centre right of the photograph - the black building of 5 bays with its gable ends facing the railway - the "Black Shed" is to its right against the railway boundary. 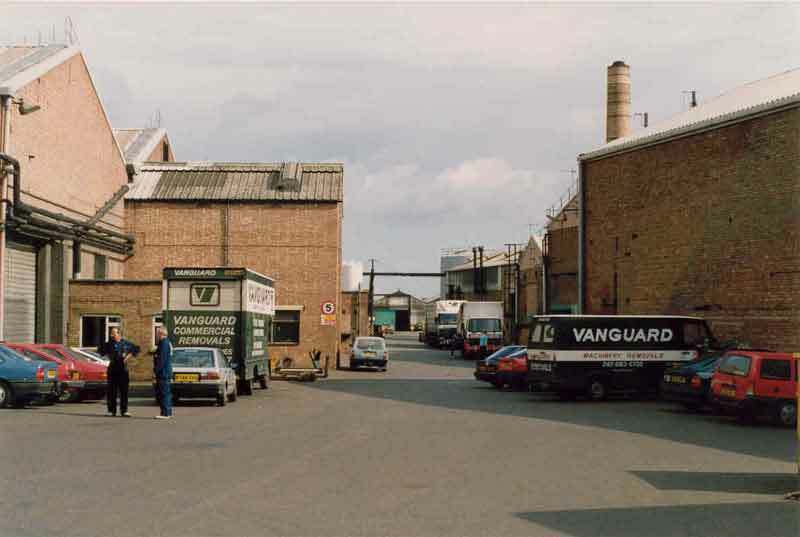 To the left of the Pattern Shop is the Foundry which marks the approximate position of the outer security wall of HMP Peterborough. The new Prison, therefore, occupies only around half of the original site. The area between what was the Pattern Shop and Westfield Road is currently being turned into a landscaped area to be adopted by The Peterborough City Council as a public amenity. 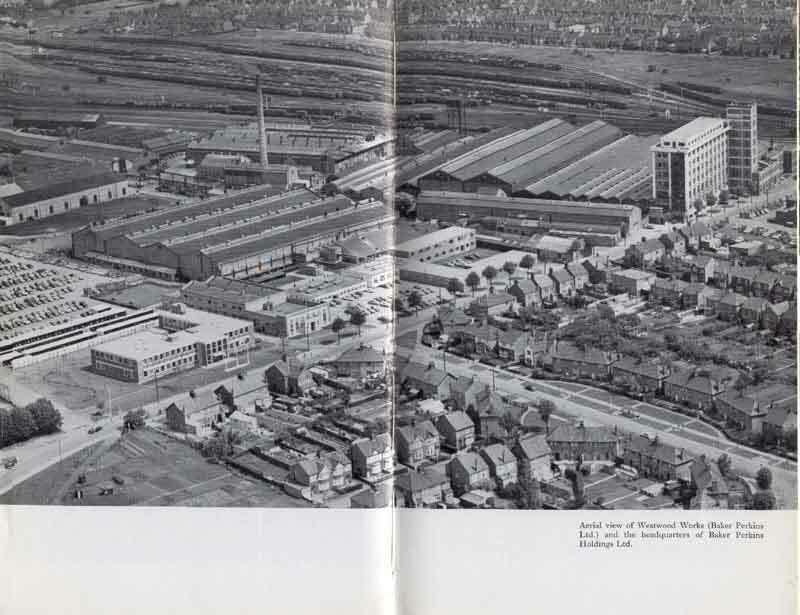 Click here to see some superb aerial photographs of the development of the Netherton Estate. 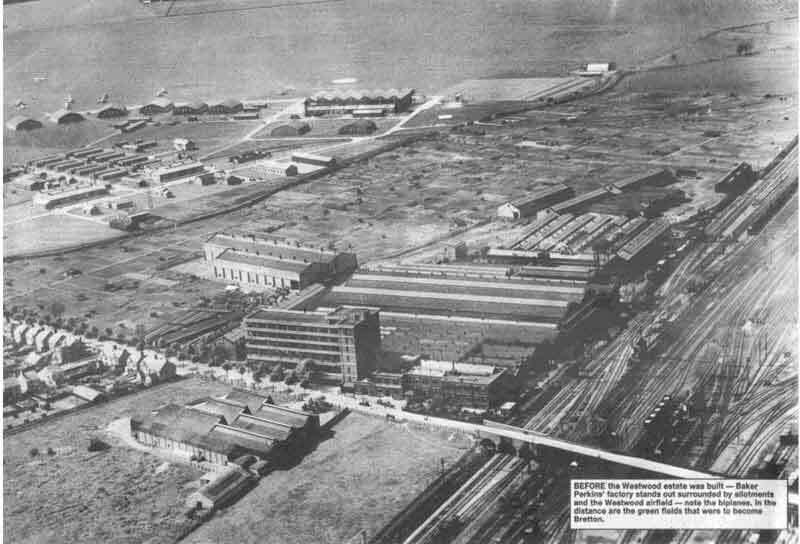 Westwood Works, Westwood Airfield and the surrounding area can be seen clearly. These photographs are displayed with the kind permission of the Netherton Neighbourhood Association. Letter written in 1932 by F.C. 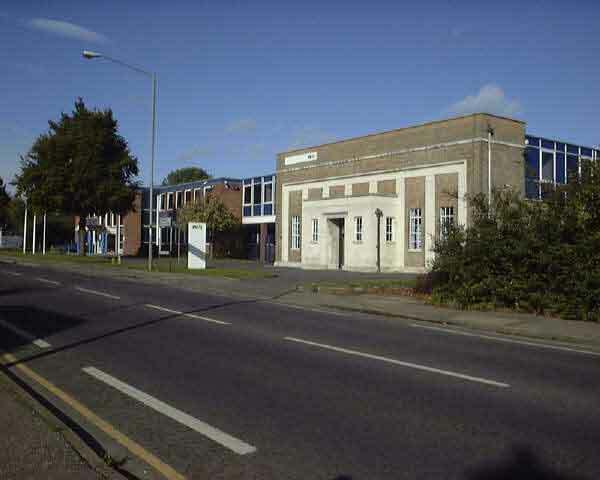 Ihlee to Peterborough Council, seeking approval to the preliminary plans for the first Multi-storey Office block. 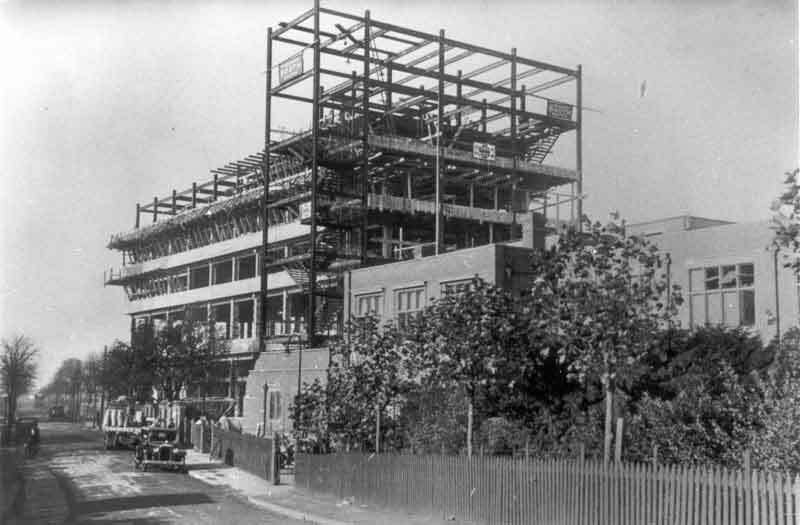 The building work was completed in 1933. Comparison of the date when the letter was written with that of the confirmation note at the bottom of the page, would indicate that Council decisions could be made quite quickly in those days. 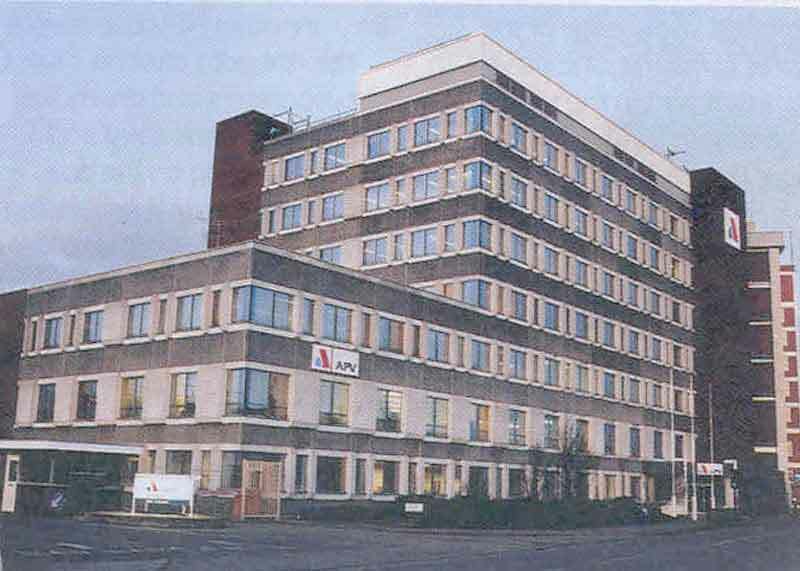 It is interesting to note that the heating system for the 1933 Building was designed by the Collier Street, London, Office of what was, before the merger in 1919, the Heating and Ventilation business of A.M. Perkins & Sons. 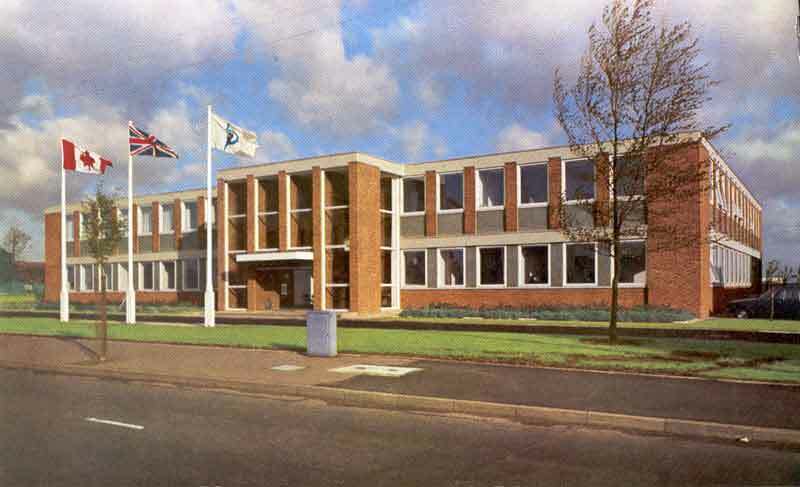 the staff from this office moved up to Peterborough - it is thought ,in 1940 - to form the Baker Perkins Ltd. Heating & Ventilation Dept. An evocative image for all those who worked in the 1933 multi-story office block. Apparently, as the building was being erected, these rivets were heated up at ground level, then flicked up the frame floor by floor. 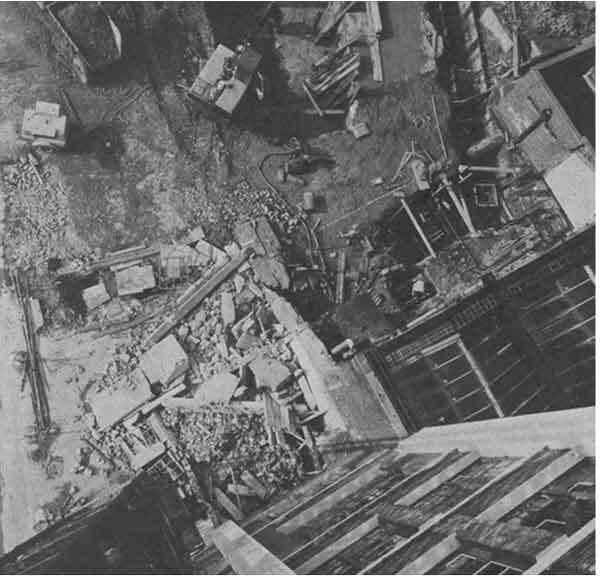 A man stood on each floor with a bucket in which he caught the hot rivet and then flicked it to the next floor level. 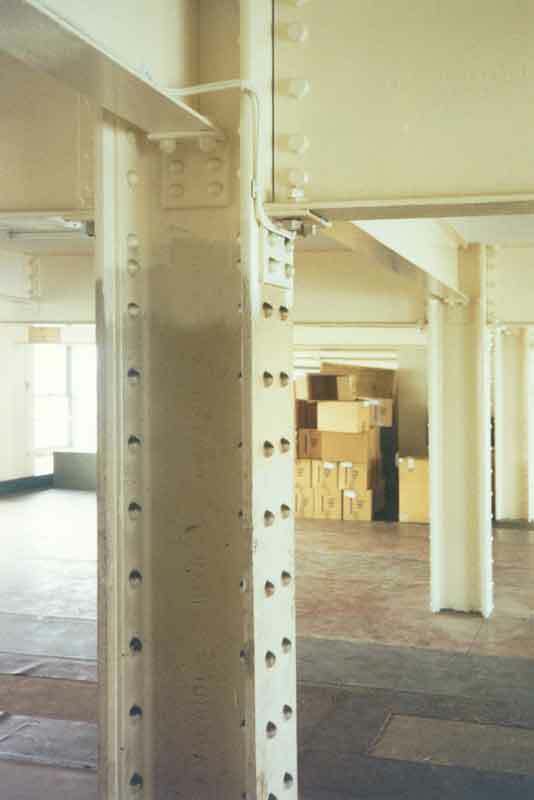 This task was carried out so fast that the rivets were still workable at the top of the building! 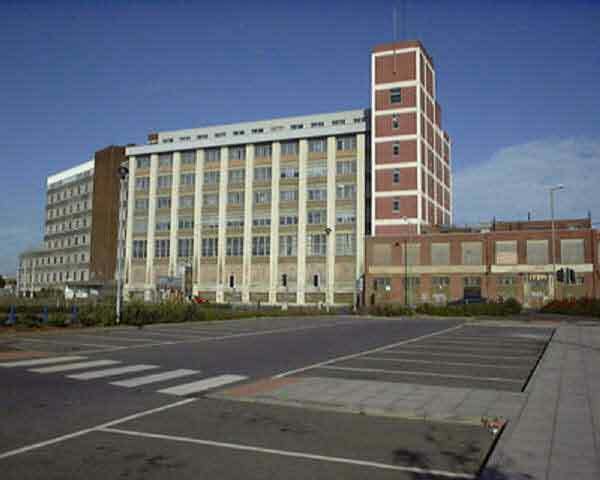 The iconic nature of its multi-storey office block has given rise over the years to a steady stream of rumours suggesting that the building hosted activities unconnected to Baker Perkins' normal commercial activities. 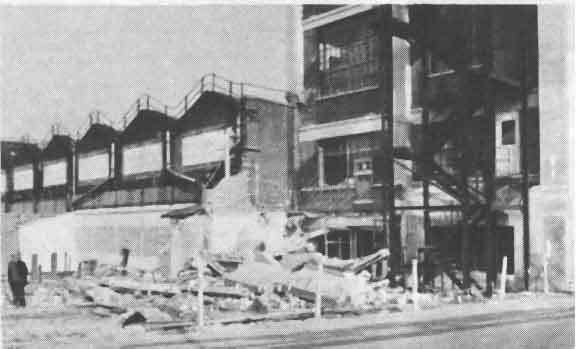 It is well known that the Air Ministry commandeered the office block in April 1934 as an aiming point in RAF bomber squadron exercises in the run-up to WW2 but rumours persist long after the building itself was demolished. 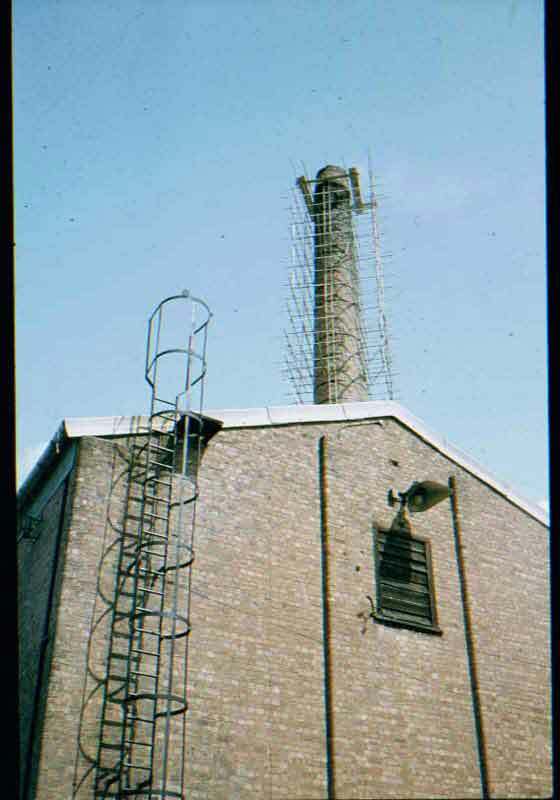 Developed in 1938/39, the feared banshee wail of an air raid siren proclaimed its installation in tall buildings across the ecountry,- the roof of the lift house on top of the offfice block in Westfield Road, being an obvious site from which to alert the greatest number in Peterborough and the surrounding area. (See also here for ex-apprentice, Glyn Bartlett's memories of servicing this equipment). Nothing doubtful about this then? But what about a Nuclear Fallout Shelter under the Strong Room Glyn comments: "There was a rumour that a nuclear fallout shelter was constructed under the strong room but. I could not find it, although t was in the nature of being a sometime apprentice maintenance electrician that you got around the place. 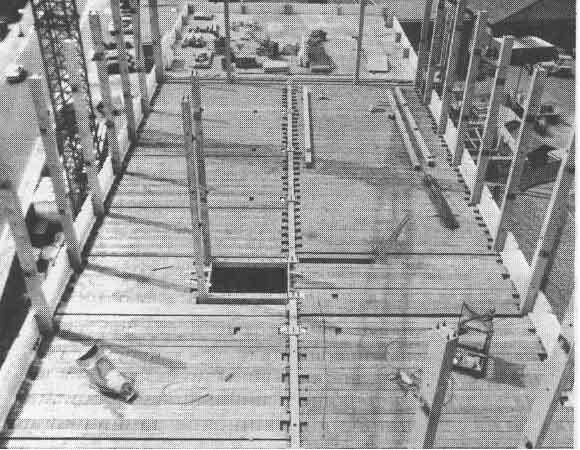 If you were going to contemplate emerging after the event then I do not think that you would want all that steel and concrete on top of you". The latest rumour we have heard is that,- once again taking advantage of the height of the building, and its clear "line of sight" - the office block was chosen to house a local Police radio systems base station on top of the lift shaft. We are not sure whether, although the building is long gone, its one time location is still considered a matter of national security. Perhaps someone out there can comment on this. Assuming that there were no other "secrets" concealed within the six floors of this building, perhaps we should close with one of the earliest submissions to our "Reminiscences" section way back in May 2004 - Questionable goings-on" by John Rouse. This site plans below show the situation over the years. The building names are as of that time. Inevitably, over time the use to which some buildings have been put has changed. If other site plans exist showing the site at an earlier date, we would be pleased to see them. 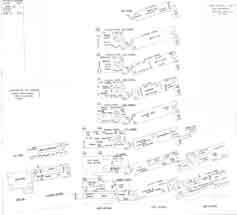 To maximise legibility, we have deliberately made the 1991 plan larger than 800x600 pixels, so you will need to scroll around the full image using your keyboard's arrow keys or the on-screen horizontal and vertical scroll bars. Can you help to fill in any missing dates? If so, please see this page for instructions on how to contact us and we'll update the captions. For more views of the offices and factory, see the Awaiting the Developers page. One of the images above depicts the rail crash which occurred just north of Westwood Bridge on the 1st September 1955. 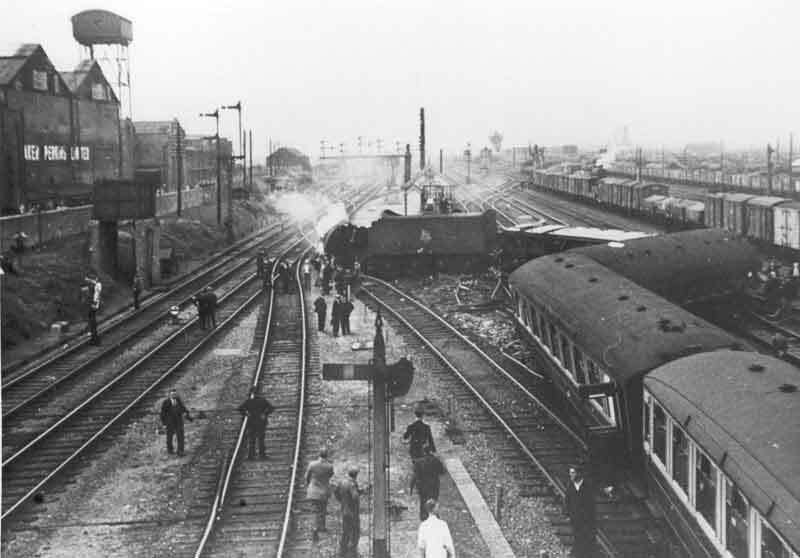 The 3.50pm Kings Cross to Leeds express was accelerating away from Peterborough North Station when it suffered a complete fracture of the front bogie frame. Broken parts came into contact with the track causing progressively more damage. 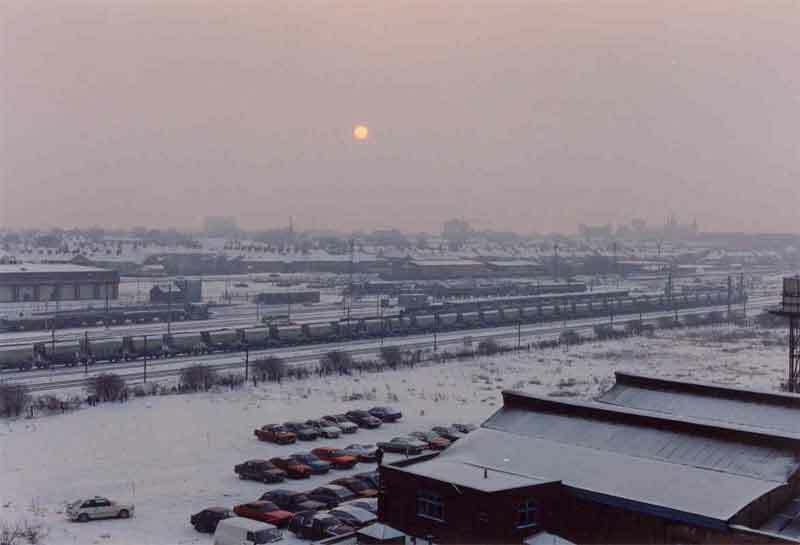 The train was travelling at 20 mph by the time that it had reached Westwood Junction, where points connected the Great Northern main lines with the former Midland Peterborough to Leicester line. 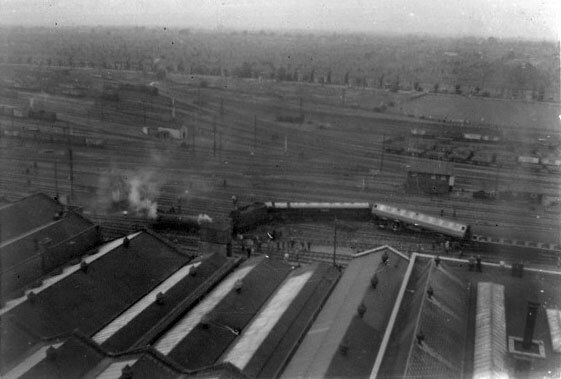 The locomotive was completely derailed and the two leading coaches fell onto their sides. Luckily, due to the low speed, only five passengers were injured, four of whom were detained in hospital. The loco crew were not injured, nor were the signalman and telegraph lad in Westwood Junction Signal Box a few yards from where the locomotive came to rest. The Baker Perkins' works fire brigade and ambulance volunteers immediately turned out, cutting a large hole in the lineside fence through which they passed ladders and blankets. The passengers were provided with tea in the works canteen. Clearing up after the accident was achieved remarkably quickly with the main line being opened to traffic by 9.20am the next morning. (The photographs were taken by the late Geoff Steels - a Senior Draughtsman at Baker Perkins - and are published here with the kind permission of Peter Waszak and Brian White of "Nene Steam" Magazine. We apologise for the poor standard of these images - this has nothing to do with the quality of Geoff's original photographs). For the steam buffs, the locomotive was the unique W1 Class, built as the famous LNER Hush-Hush steam engine No.10000 in 1929 with an experimental high pressure "Jarrow" water tube boiler and rebuilt into a conventional streamlined locomotive in 1936. 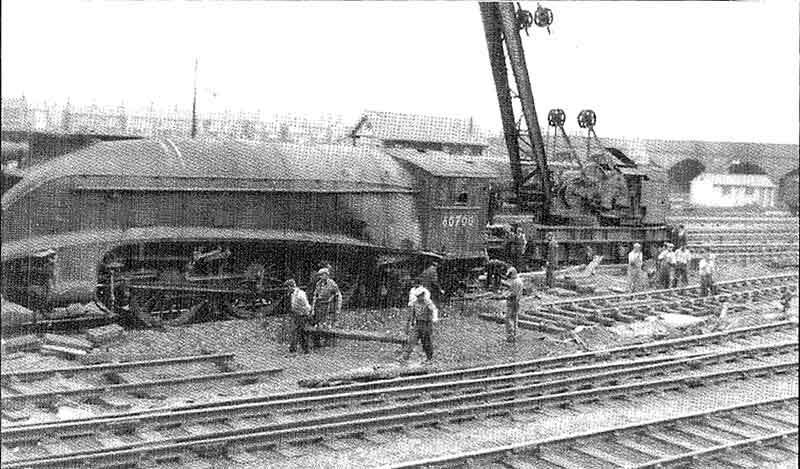 It was repaired and returned to service soon after the accident, finally being scrapped in July 1959.